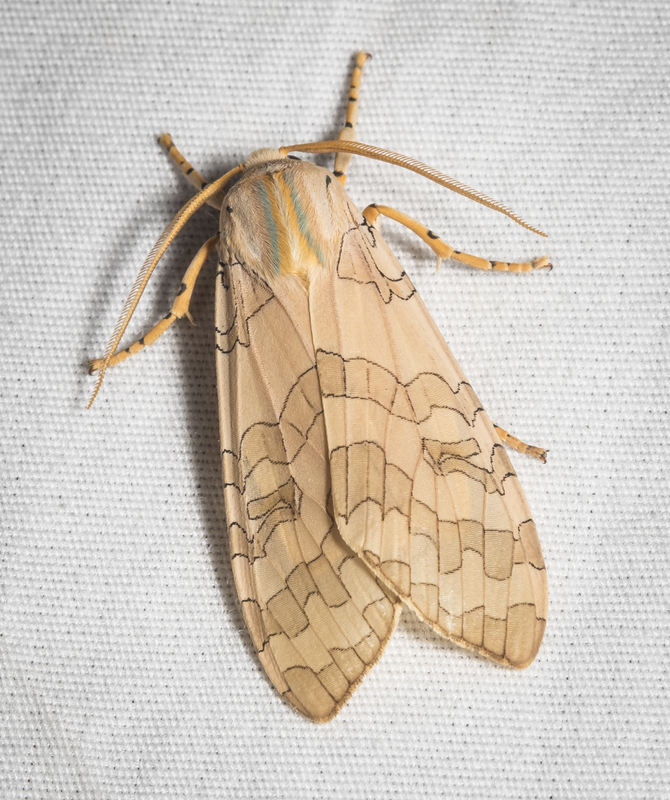 The last post had some recognizable moths, some big ones, some brightly colored ones. 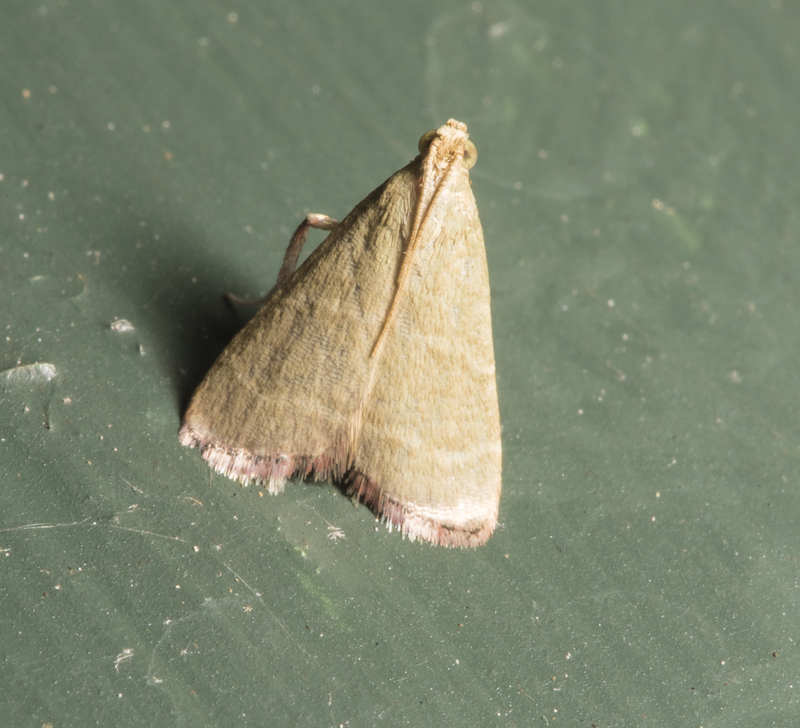 But countless moths are frustratingly small (when you are trying to identify them), and many are, at least at first glance, LBT’s (little brown things). But the magic of a macro lens is that it brings out their beauty once you enlarge them on your screen, making it somewhat easier to flip through the pages of a field guide until you find one that is similar. Yet they are all beautiful in their own way and worthy of our attention and appreciation. Once again, if I have made an ID error, I welcome comments and corrections. 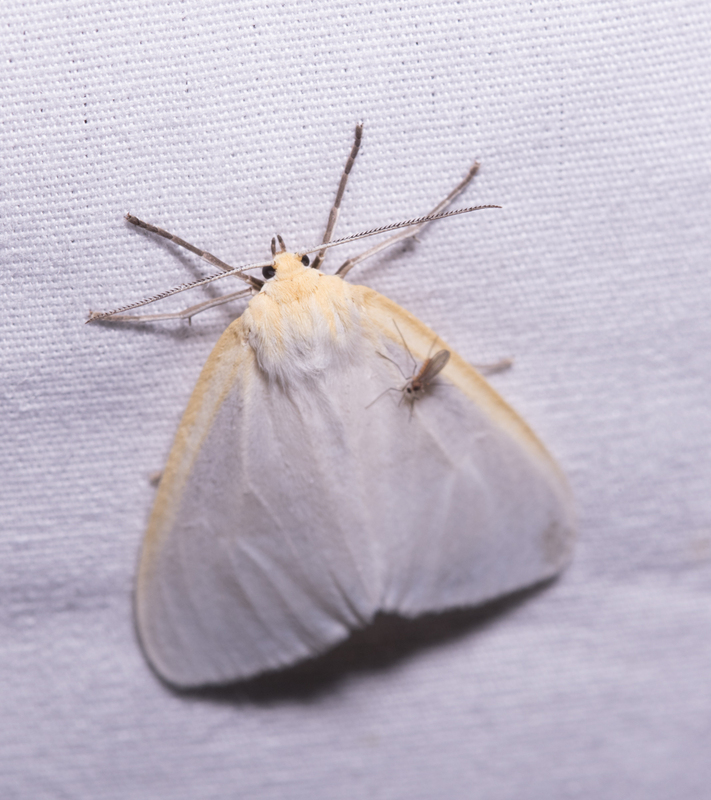 Here are some of the littler ones that came to the moth light. 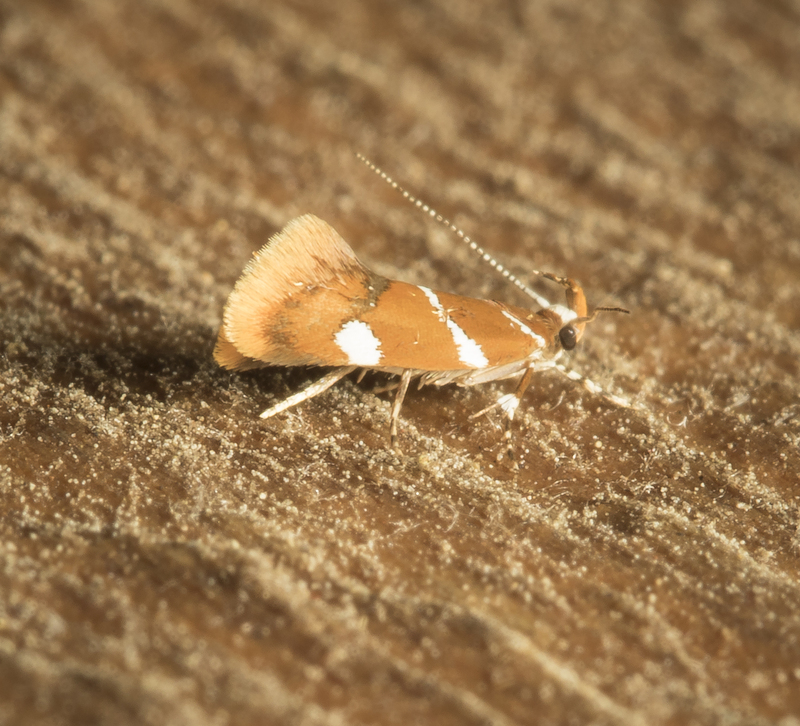 I love the variation in shape, colors, and patterns of these tiny night-time visitors. …to understand something of the wonders of a world which becomes the more wonderful the more we know of it. 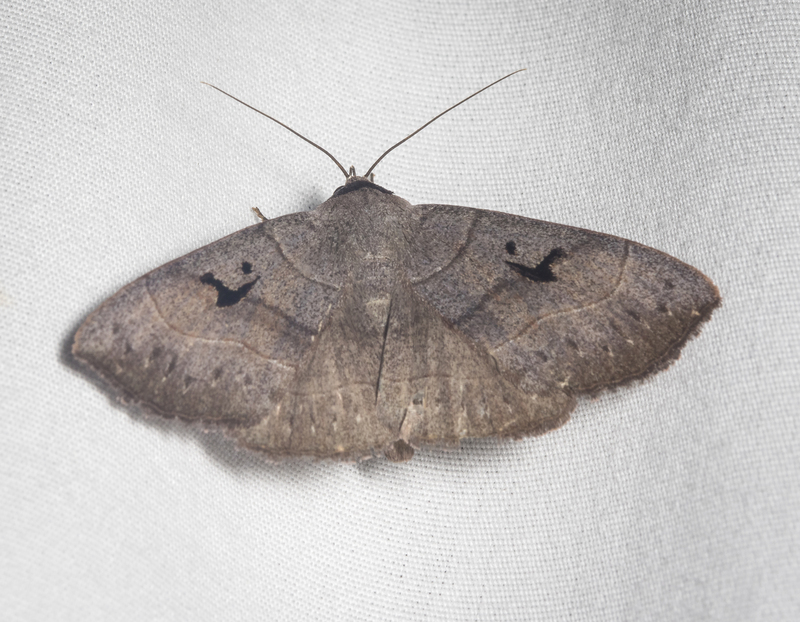 I set out my moth light for two nights a little over a week ago to see what species might drop by here at the house. 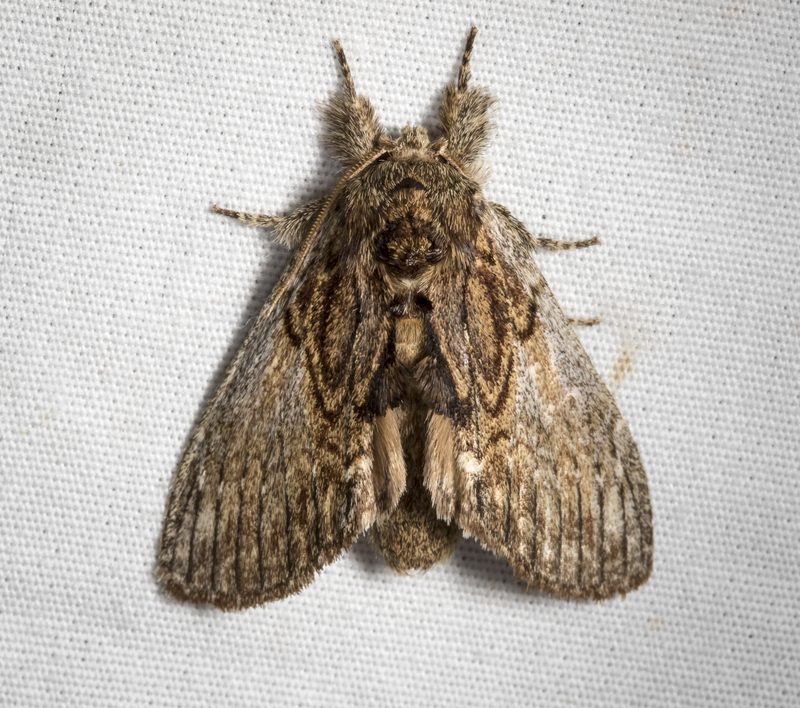 Melissa and I gave a moth program at work the week before that and, though we didn’t get a tremendous number of moths that night (in part, due to the early hours for families), it did reignite my moth fever. One night I put the sheet on the clothesline out the basement door. The second night I strung it up on the back deck outside the living room. Both nights I turned outside lights on in addition to having a black light set up next to a cotton sheet. I checked the lights from sunset until about 12:30 p.m. both nights. Things started slow and peaked between 11 p.m. and midnight. The thing I find so fascinating about moths is their diversity and beauty when you actually take the time to look at them. 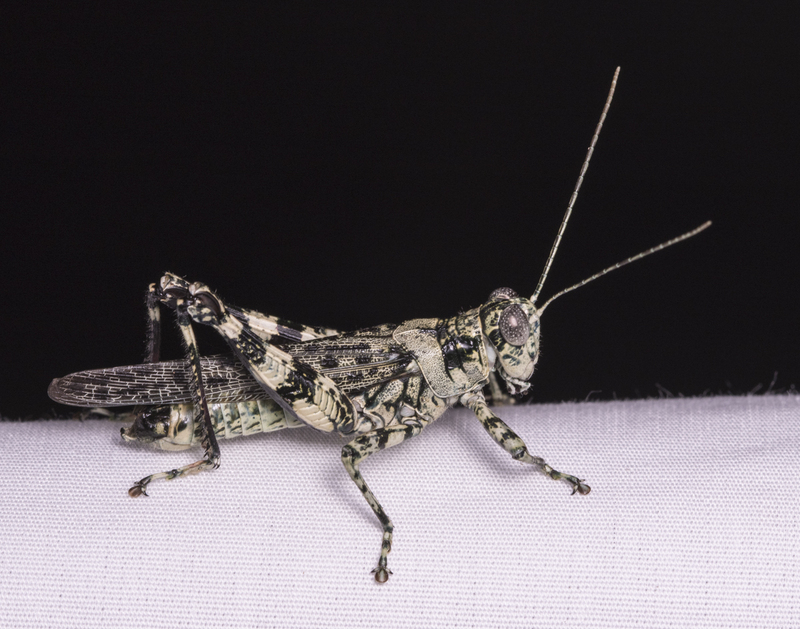 Many are, at first glance, just brown nondescript bugs, seemingly impossible to tell apart. But a closer look, and their colors and patterns are incredible. I do find them very challenging to identify, but there are a host of online resources that can really help. 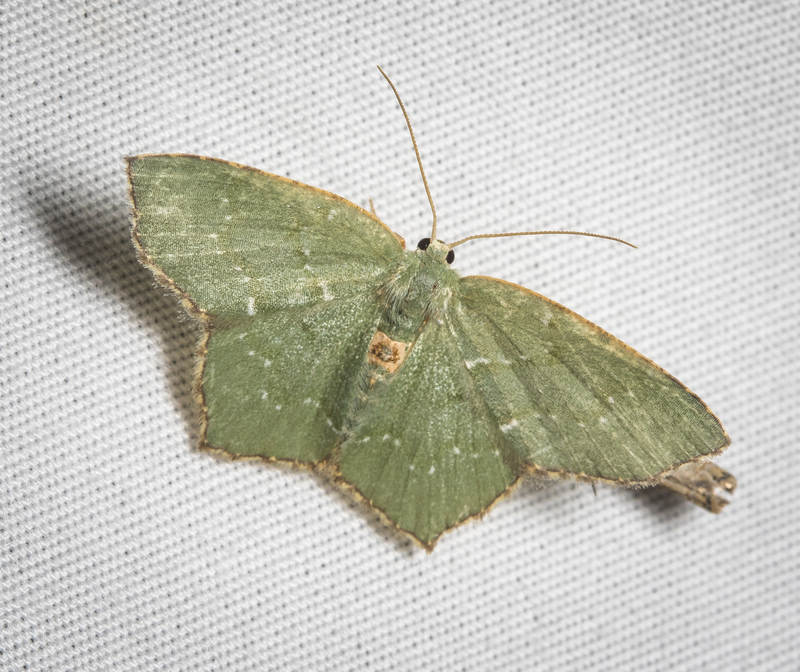 Among my favorites are: Moths of North Carolina, Bug Guide, Butterflies and Moths of North America, and the North American Moth Photographers Group. 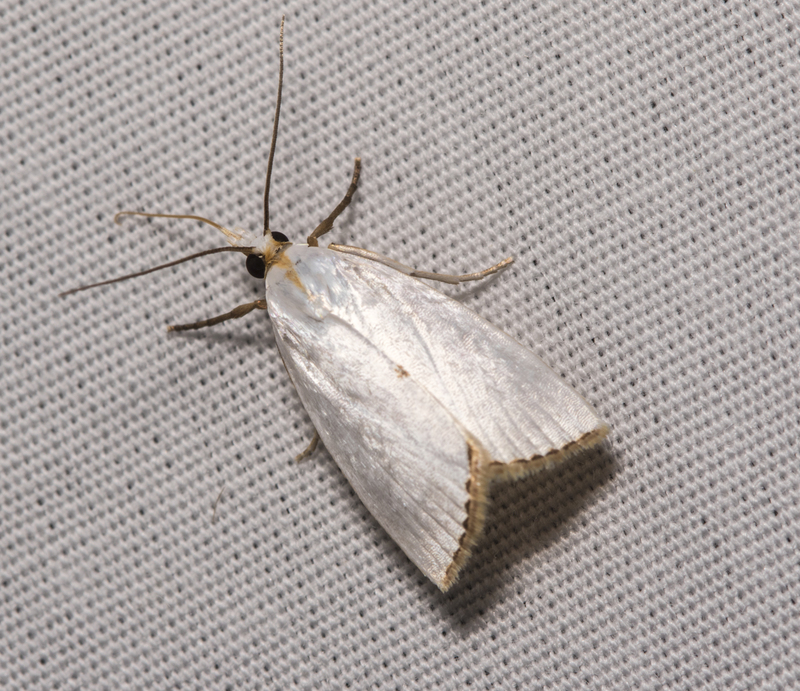 But the real game-changer for me was the publication last spring of the Peterson Field Guide to Moths of the Southeastern North America. 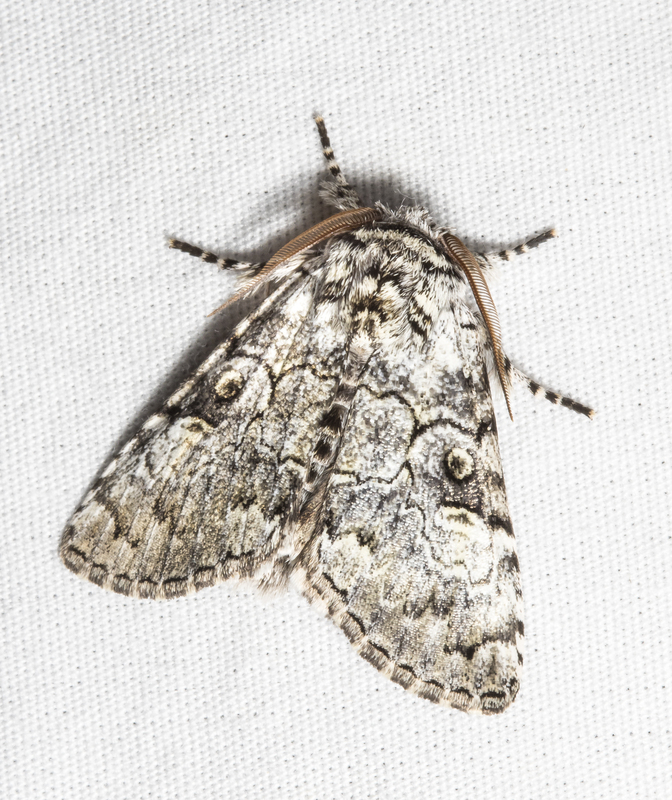 I had purchased their guide to moths of the northeast when it came out a couple of years ago and it had been helpful, but, obviously, not comprehensive for our region. But my copy of the new guide is already showing signs of wear as I have flipped through its pages countless times searching for a species new to me at the lights at home or at work. 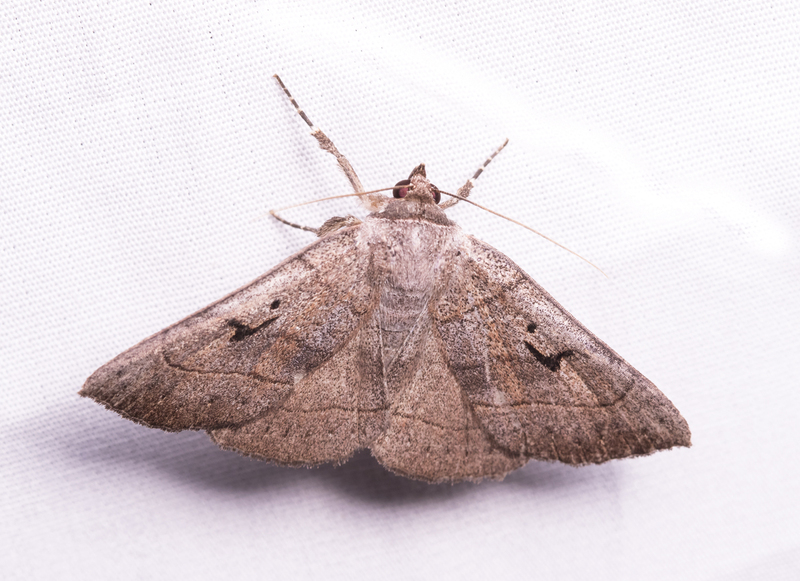 The challenge in moth identification is looking for key characteristics. A look at the online resources for any one species reveals the amazing variation between individuals of some species. And, of course, the printed field guide has space for only the most common variety (generally only one picture is chosen to represent an entire species’ variability). So, having said that, I have done my best (along with Melissa’s help) to identify these to species, but there is a chance some may be misidentified. If anyone catches a mistake, please share in the comments section. 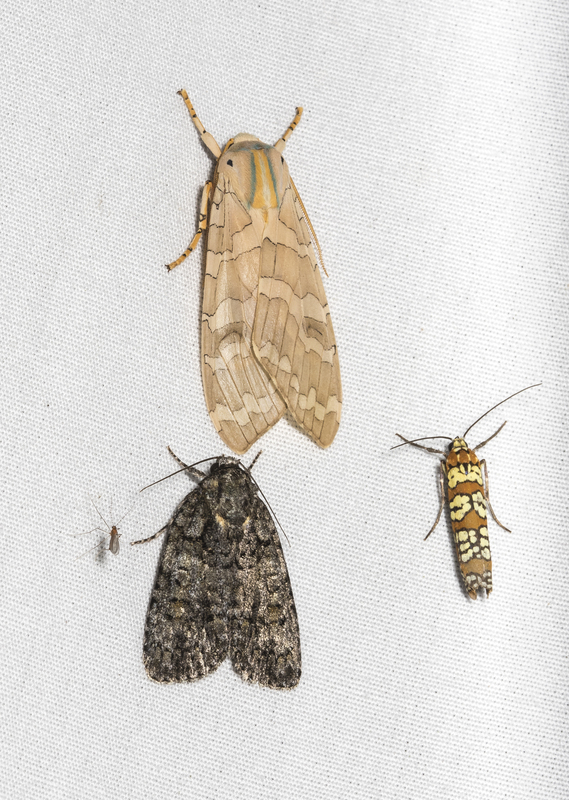 Below are some of the larger moths (those approximately an inch or more in length) that came to the lights. More of the smaller ones will be shared in my next post. 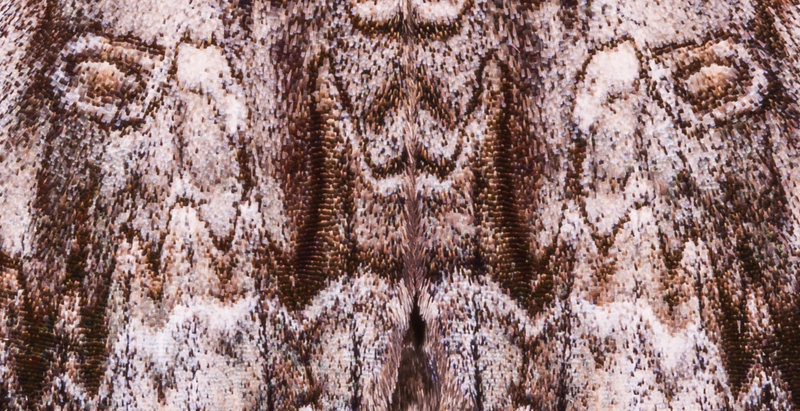 I love the pattern and colors of this moth. 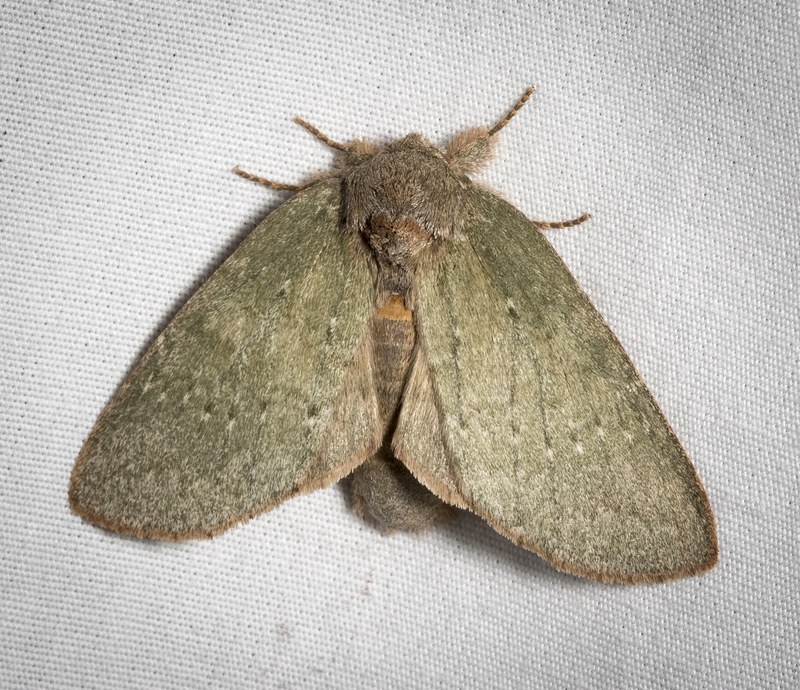 It is either a Banded Tussock or a Sycamore Tussock Moth (Halysidota tesselaris/harrisii). They are apparently very difficult to tell apart, and both caterpillar species are common here. 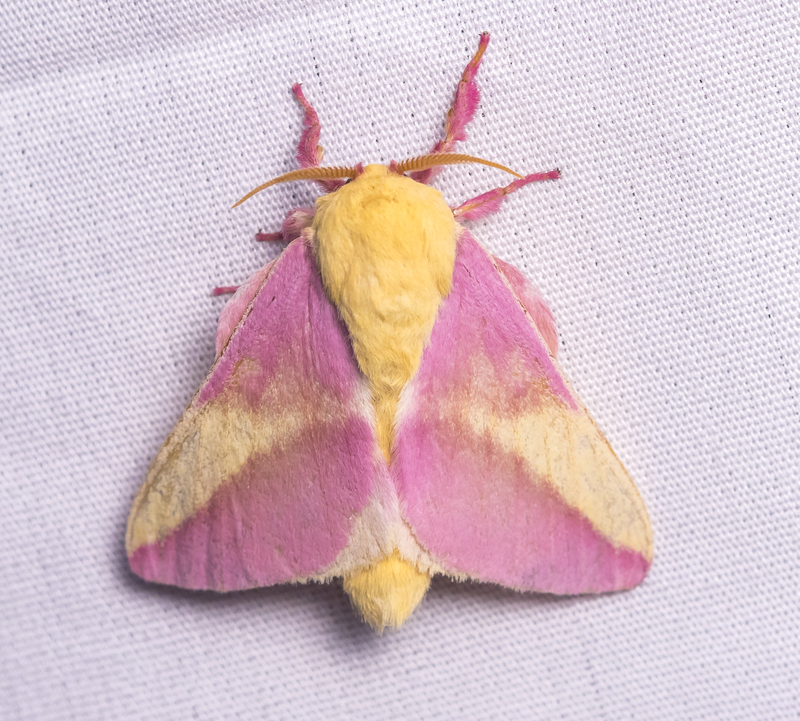 One of the more common species at the sheet was the beautiful Rosy Maple Moth, Dryocampa rubicunda. 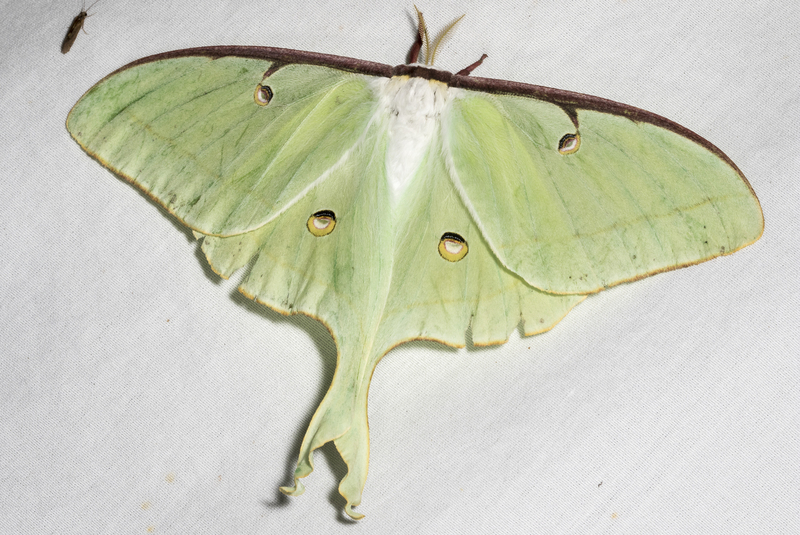 Always happy to see a Luna Moth, Actias luna. There are other green guys out there – like this Angle-winged Emerald, Chloropteryx tepperaria. 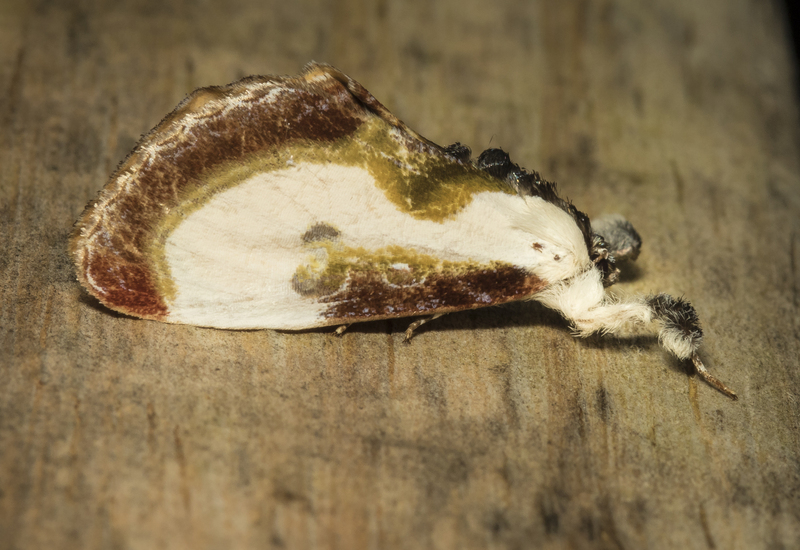 Something appears to be wrong with the wings of this Mottled Prominent, Macrurocampa marthesia. 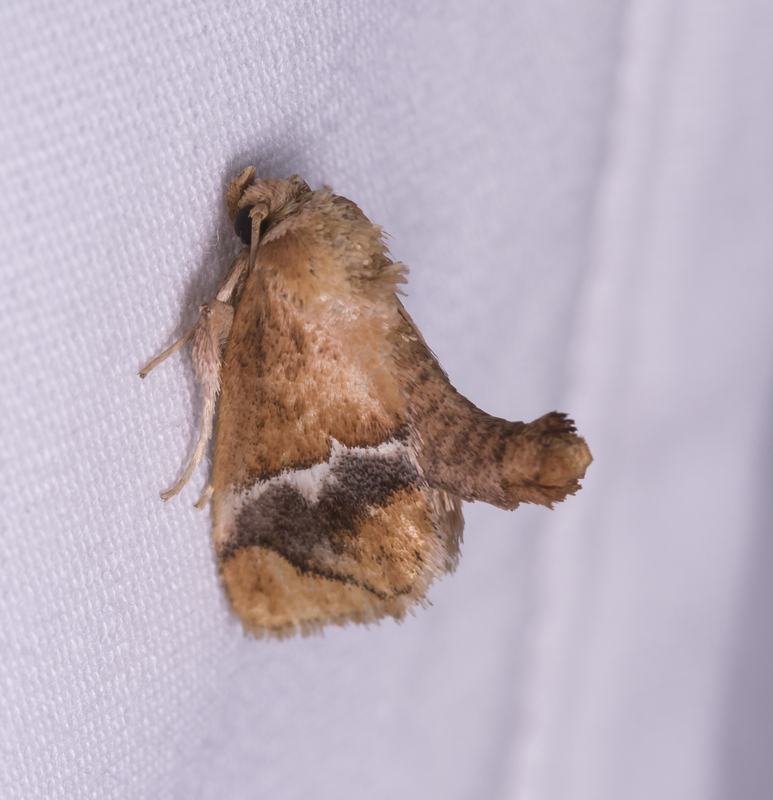 Love the shoulder pattern on this Oval-based Prominent, Peridea basitriens. 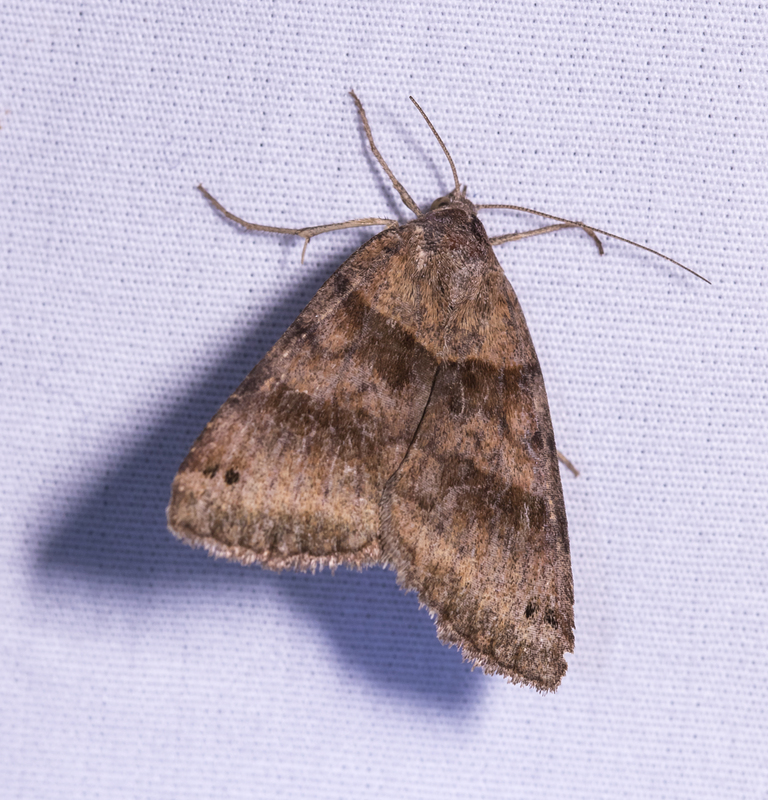 Moth common names are fascinating, like this one – The Laugher, Charadra deridens. 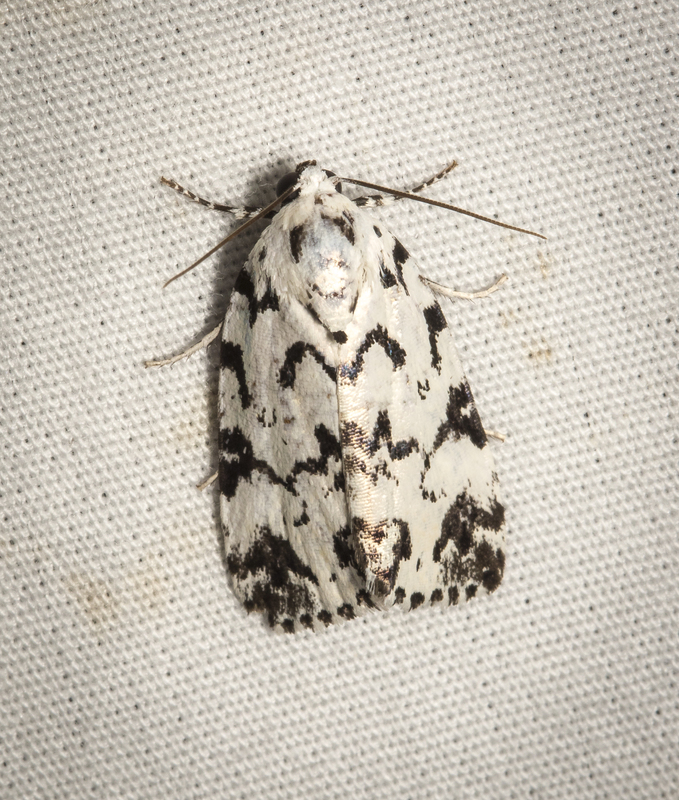 The Hebrew, Polygrammate hebraeicum, so-named because the black markings somewhat resemble Hebrew script. It is looking at things for a long time that ripens you and gives you a deeper meaning. 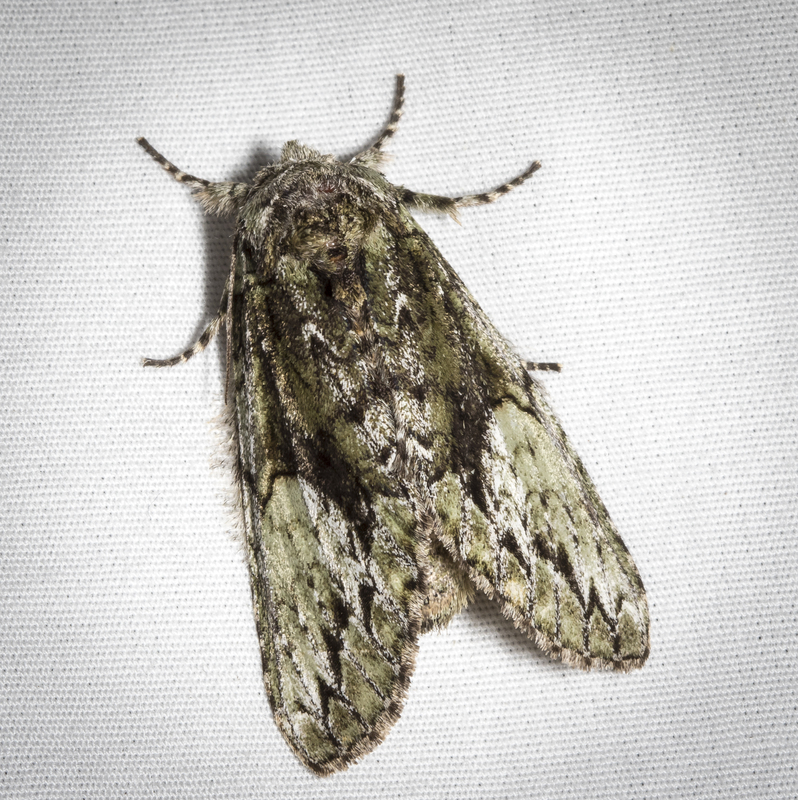 If Van Gogh is correct, then I am ripe and have found deeper meaning, at least as far as mothing is concerned. 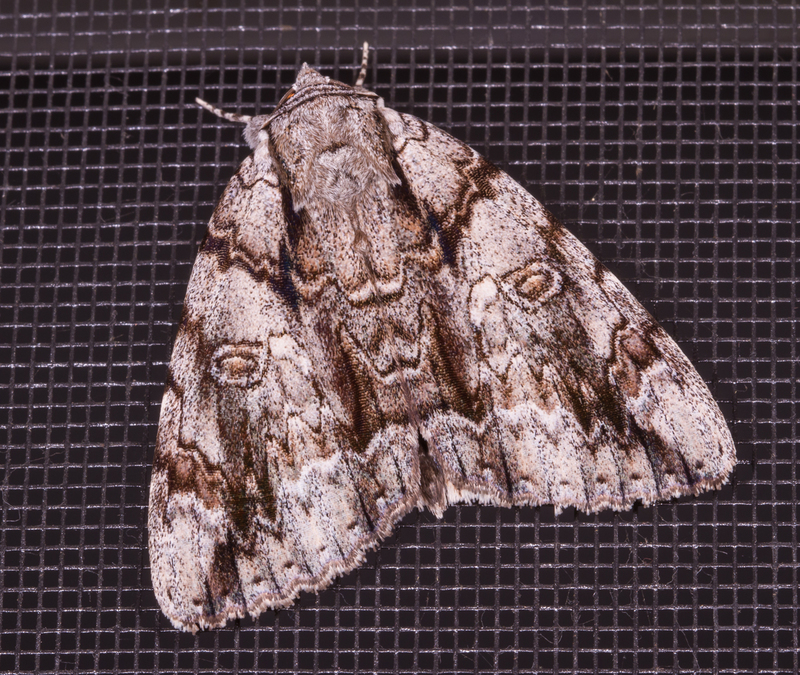 On the final night of National Moth Week, 2015, I set up the moth light on a farm gate at my parents’ home in the mountains of southwest Virginia. The habitat is very different from where I live. Besides being near the mountains and a river running out back, there is a lot more open ground than I have in my Chatham County woods. In fact, it is mostly open pasture that Dad mows for hay twice each summer. I set the UV light and sheet up along a line of trees that separates their lawn from the pasture. 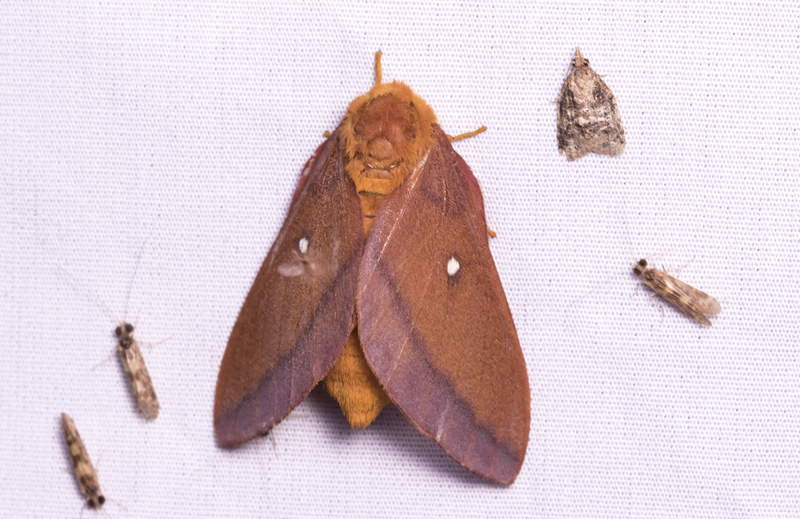 I really wasn’t expecting the kind of diversity I saw in my wooded yard, but wasn’t really sure what might attend the moth party. As I had anticipated, the nearby river provided plenty of insects that spend part (or most) of their lives in the river. 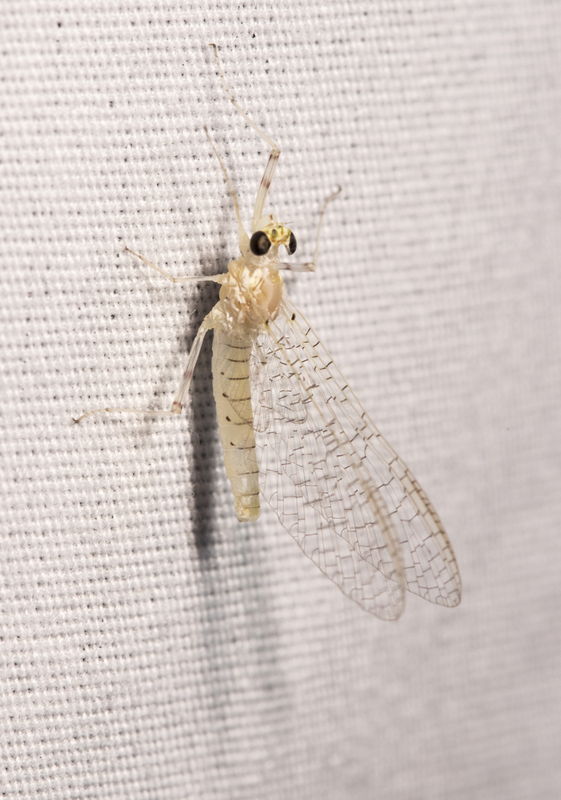 Several Caddisflies and numerous white Mayflies were early arrivals at the party. I was hoping for some Dobsonflies, but they were no-shows. 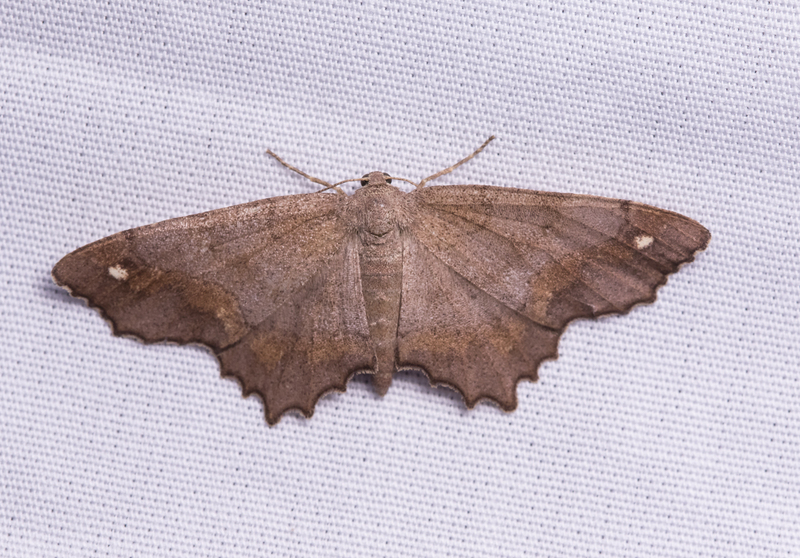 The first couple of visits to the light showed that I was probably correct – the moth diversity, at least of those large enough for me to even attempt to identify, was much less than in the woods at home. But, there were some beetles and lots of tiny flies, and what looked like very small wasps. 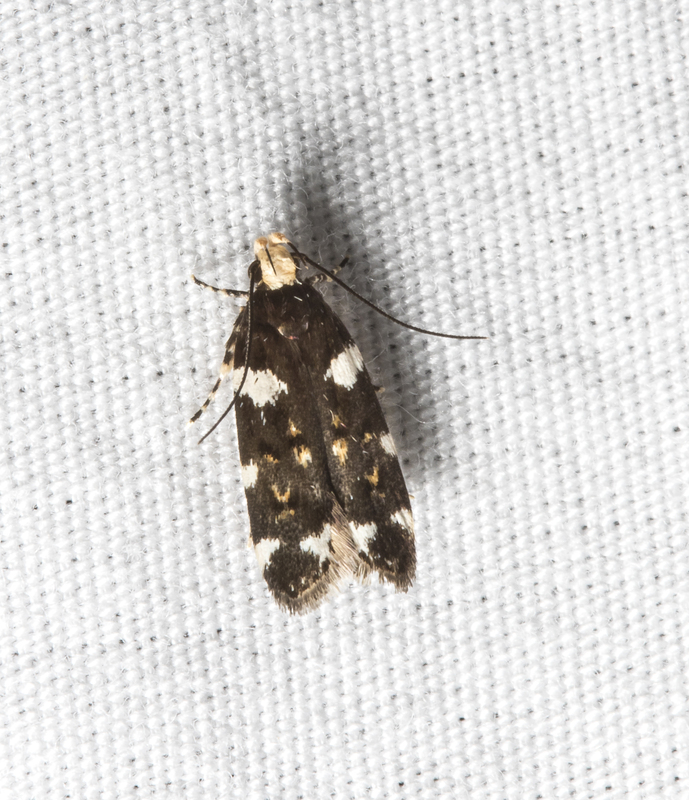 There were also plenty of small moths, some of which turned out to be quite beautiful (or strange, depending on your perspective I suppose) when you take a closer look. Not surprisingly, almost all the ones I could identify are found primarily in grassy habitats, and their larvae feed on grasses. 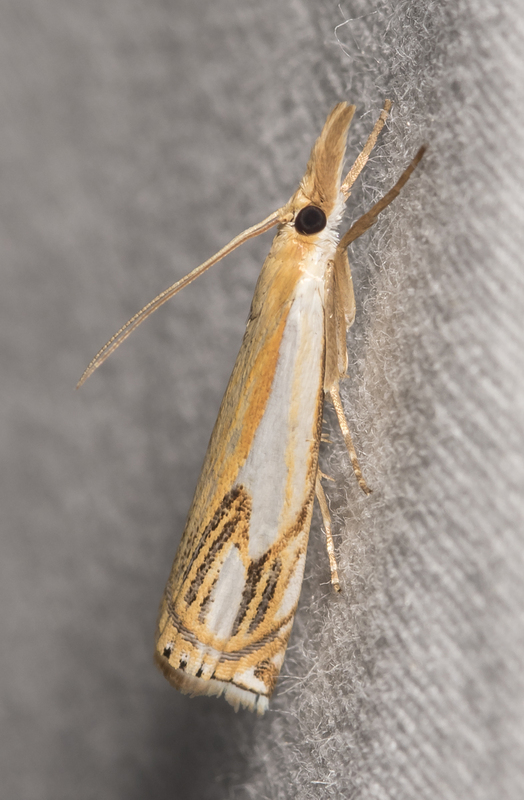 The name of one group reflects that – the Grass-veneer moths. 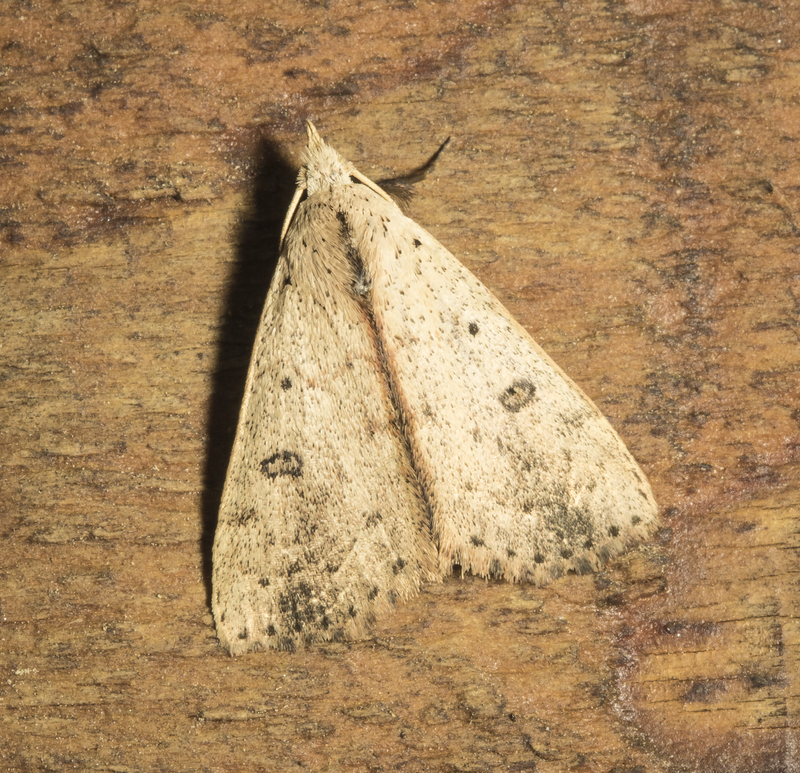 I suppose the veneer part of the name comes from their habit of tightly clinging to grasses (usually the underside) during the day, making them tough to find unless you flush them out as you walk. 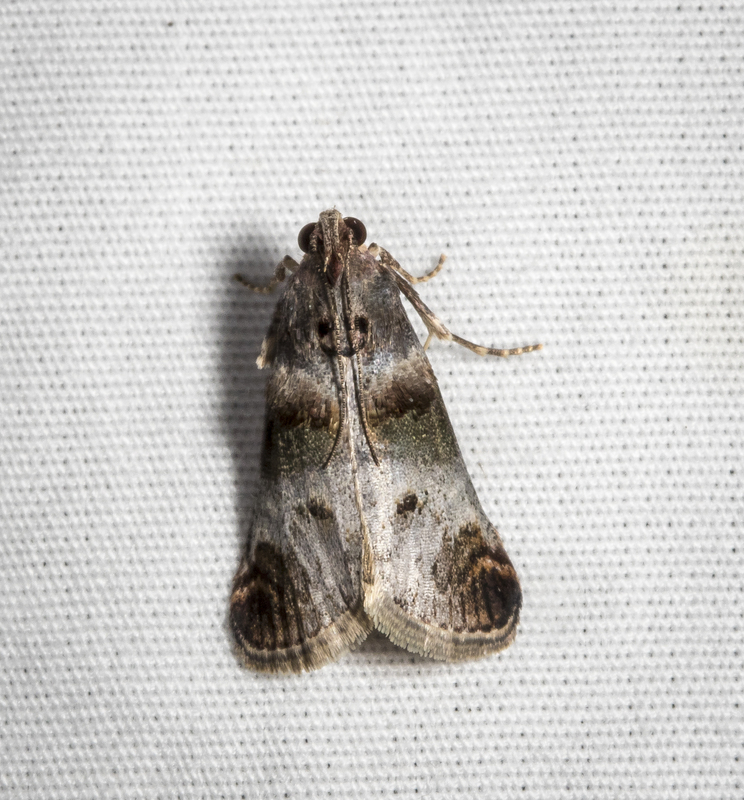 One Elegant Grass-veneer perched on my tripod next to one of the small bolts. That bolt is probably less than a half inch across so that gives you some idea of the small size of this individual. They are also distinctive in that this group tends to have long labial pals, giving them a snout-like appearance. The palps presumably function as sensory receptors of some sort. Below are a few other species I was able to tentatively identify by flipping through my field guide and online resources. 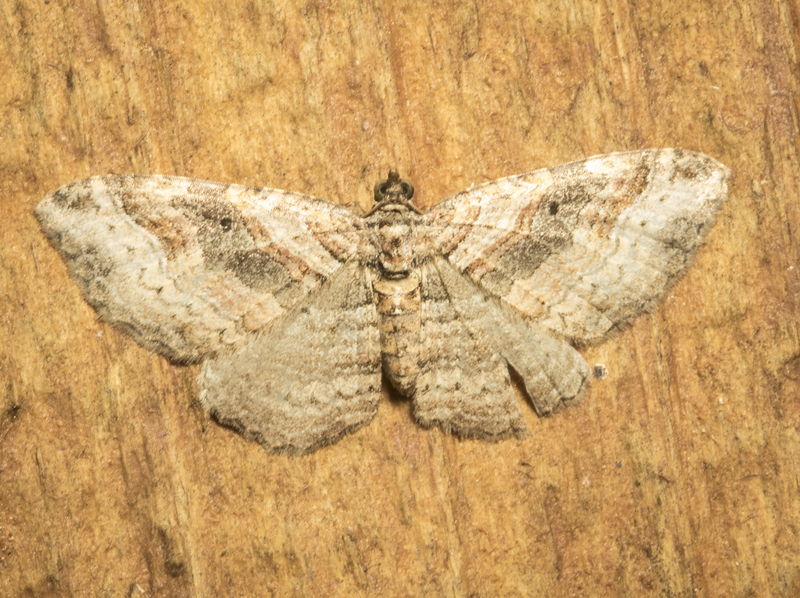 As always, any confirmations or corrections are welcome as this beginning moth-er finds it challenging. 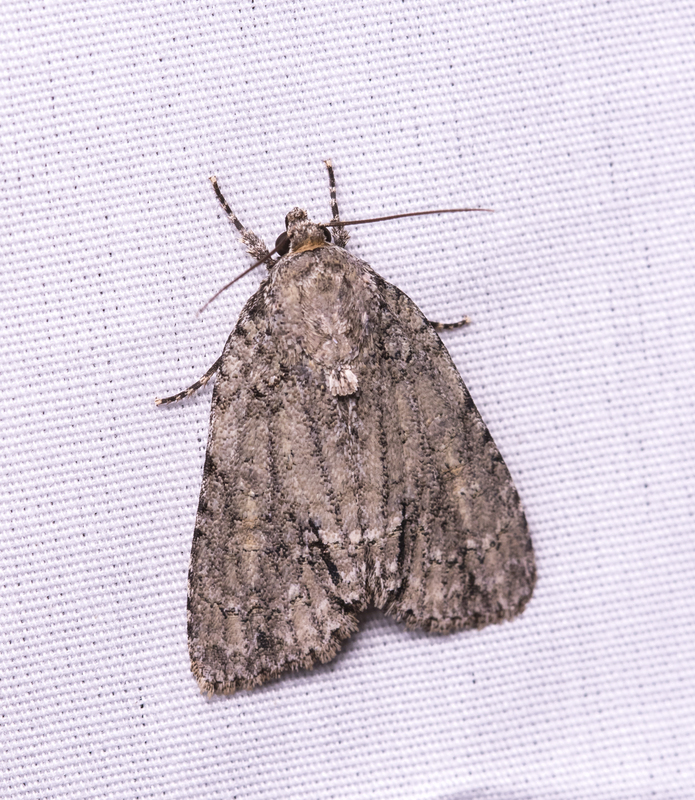 Common Gray – Anavitrinella pampinaria? 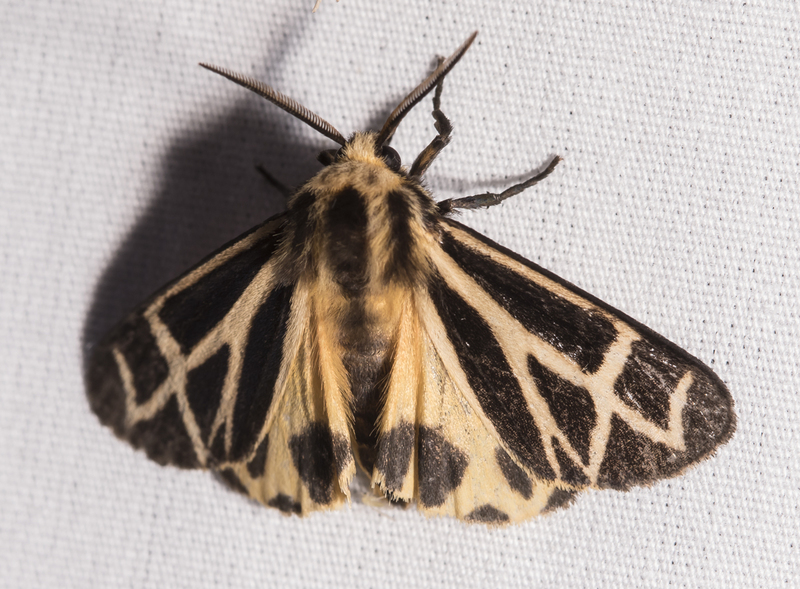 On my last check of the sheet that night, there was a new grou of moths represented – the Tiger Moths. 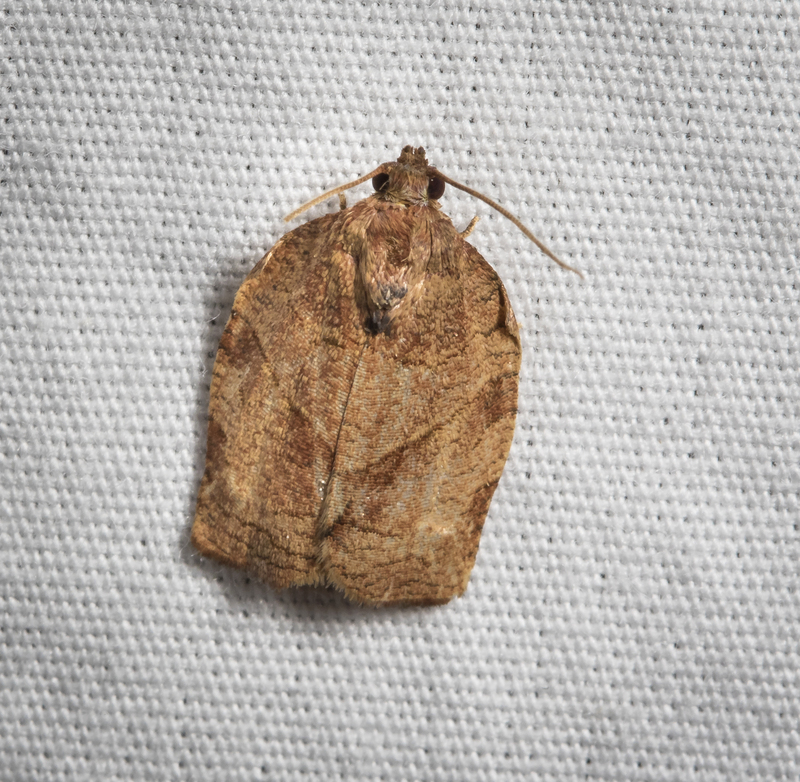 There were at least 6 of these boldly pattered, medium-sized moths on the sheet. I recognized the group but when I started to try to identify to species i was amazed at how similar some of them are. So much so that Bug Guide let me off the hook in trying to nail down a species identification with this statement about the difficulty of identifying some related species in this group…The only full-proof method is dissection and examination of genitalia. 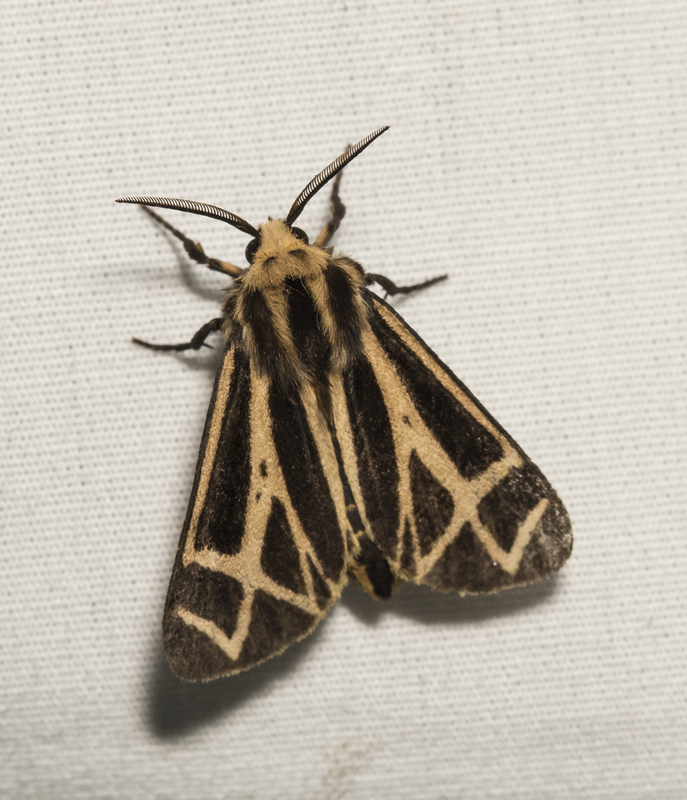 Nais Tiger Moth – Apantesis nais ? Well, then, Vincent, time to call it a night I suppose. I am not sure I am that ripe or looking for that deep of a meaning quite yet. 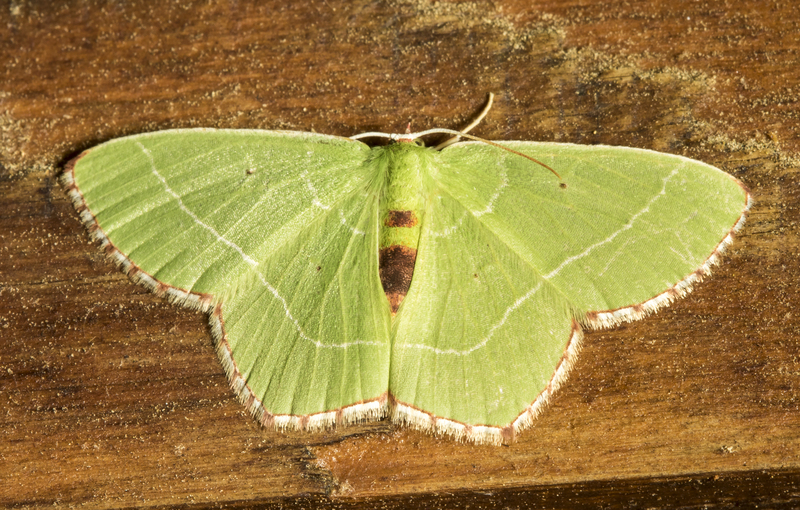 This week is National Moth Week, an annual celebration of the incredibly diverse and beautiful world of moths. 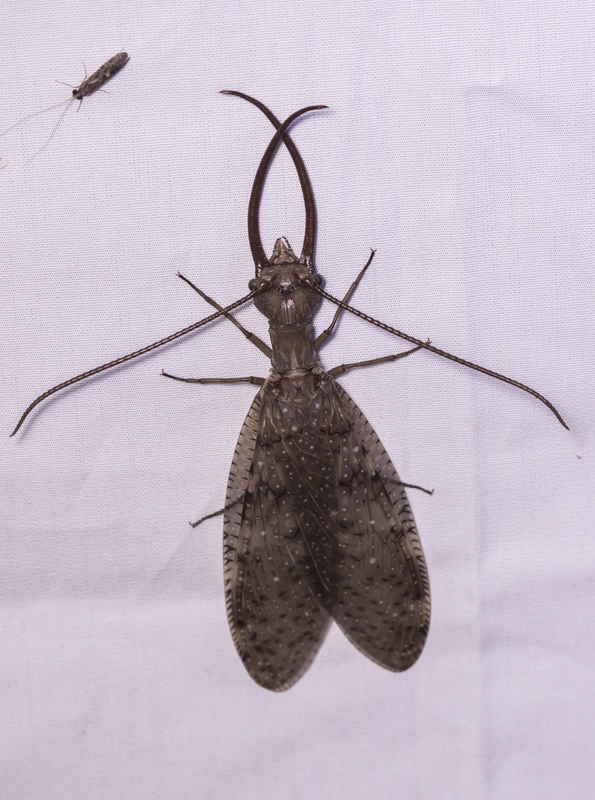 Wednesday was a busy day out in the yard, testing some different diffusion materials for my twin lites and spending a crazy amount of time photographing the Eastern Dobsonfly I discovered resting on a tree branch. 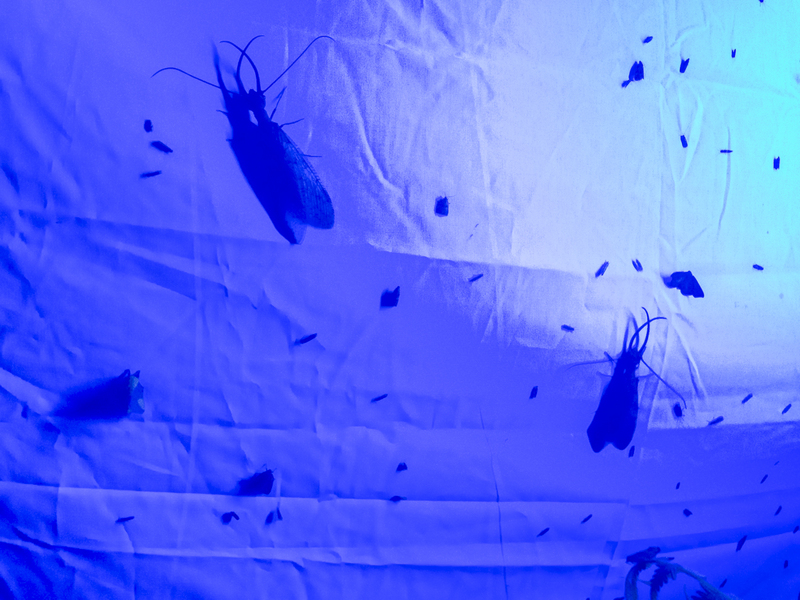 In researching the dobsonfly, I read that they are often attracted to lights at night, so it reminded me of the need to go ahead and inaugurate my new moth light. 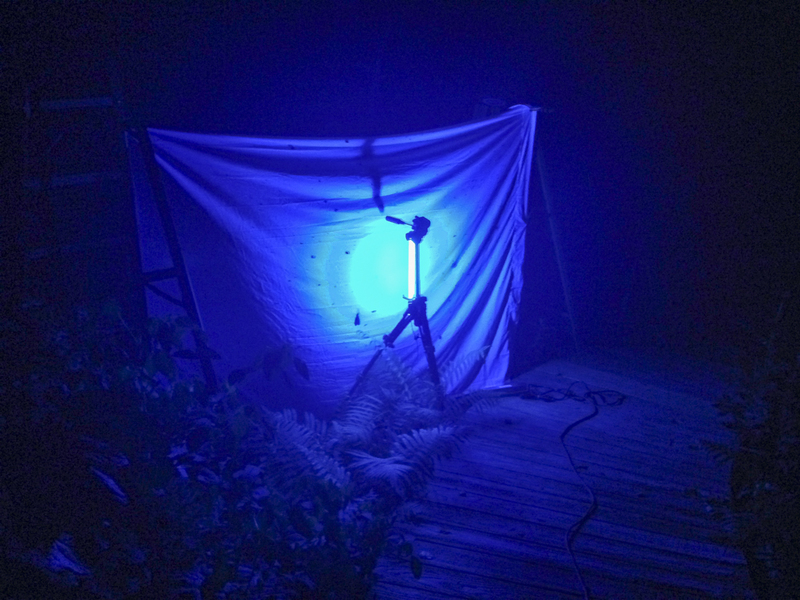 Yep, you know you are a nature nerd when you have a special light for attracting moths and other night-flying insects. 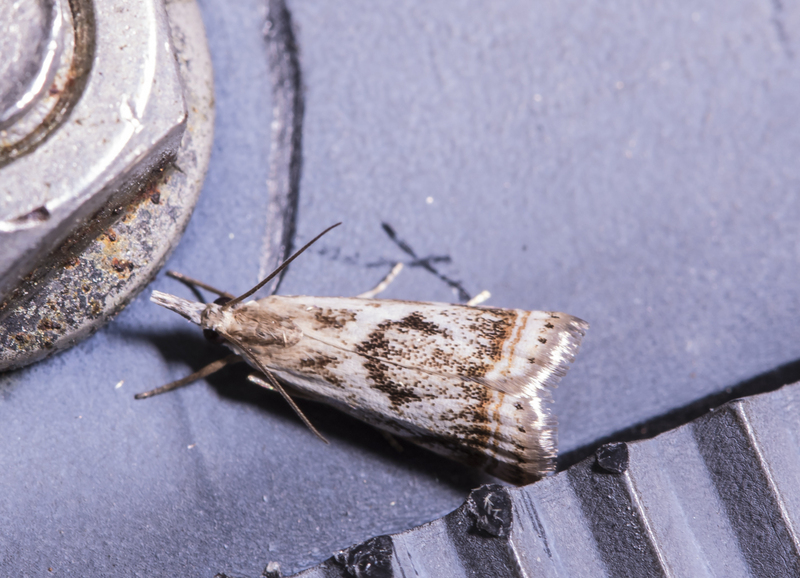 The light is an ultraviolet light, since it seems, for reasons no one is quite sure about, that moths are very attracted to UV light. The set up is simple: I stretched a cotton sheet between two step ladders (most people hang a line between two trees), clamped the sheet to the ladders, hung the light on a tripod handle, and placed the tripod in front of the sheet. I then went inside and checked on the sheet periodically over the next couple of hours. Peterson Field Guide to Northeastern North America, David Beadle and Seabrooke Leckie; North Carolina and Virginia Moth Photos (part of Will Cook’s excellent Carolina Nature web site); Moths of North Carolina (part of the excellent series of web sites hosted by NC State Parks and the NC Natural Heritage Program); Bug Guide; and the North American Moth Photographer’s Group. 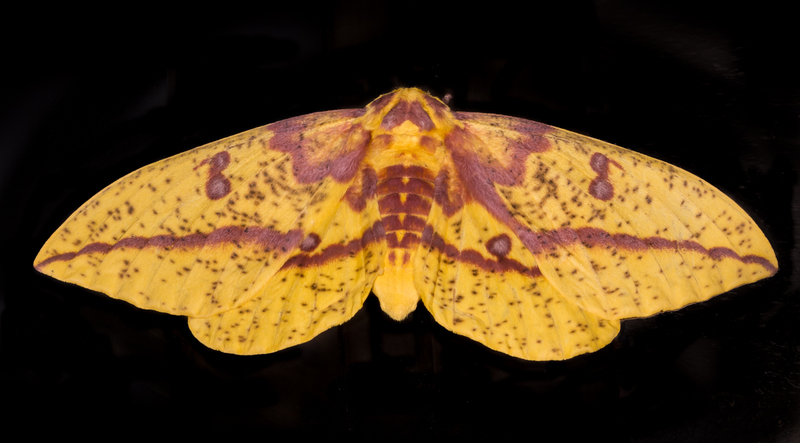 The field guide has a series of moth silhouettes that can help beginners get to major groups of moths to begin the search. Once you find something similar, you can use the various web sites to help narrow it down. I am amazed at how variable some of the species can be. But, it is a whole new world out there, and these critters are all playing various important roles in the ecosystem, from devouring the leaves and flowers of many plants, to pollinating many of our flowers, to providing food for many other species from insects and spiders to birds and bats. And many are visually stunning, so it is a pleasure to discover them just outside your door. You don’t need specialized equipment to enjoy the world of the night, just the motivation to move away from whatever screen occupies your thoughts and open the door. 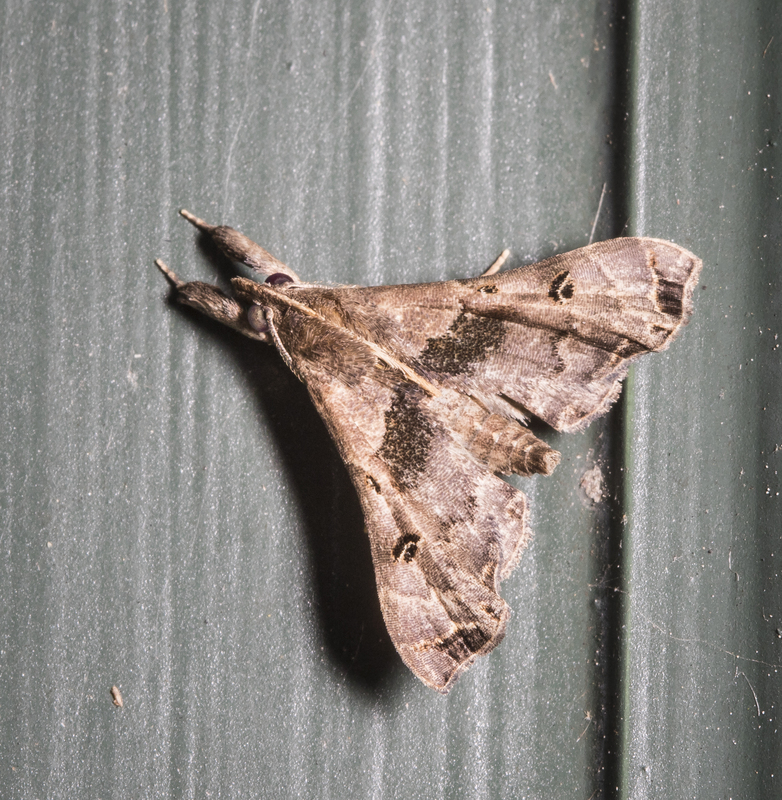 Look around the porch light, your windows, or simply shine a flashlight amongst your plants and you can enjoy the magical world of moths. 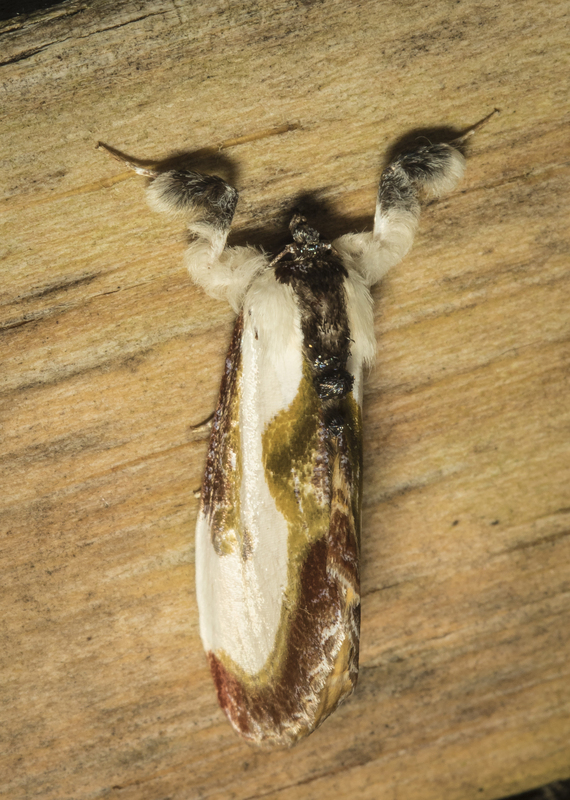 Yellow-shouldered Slug Moth, Lithacodes fasciola. 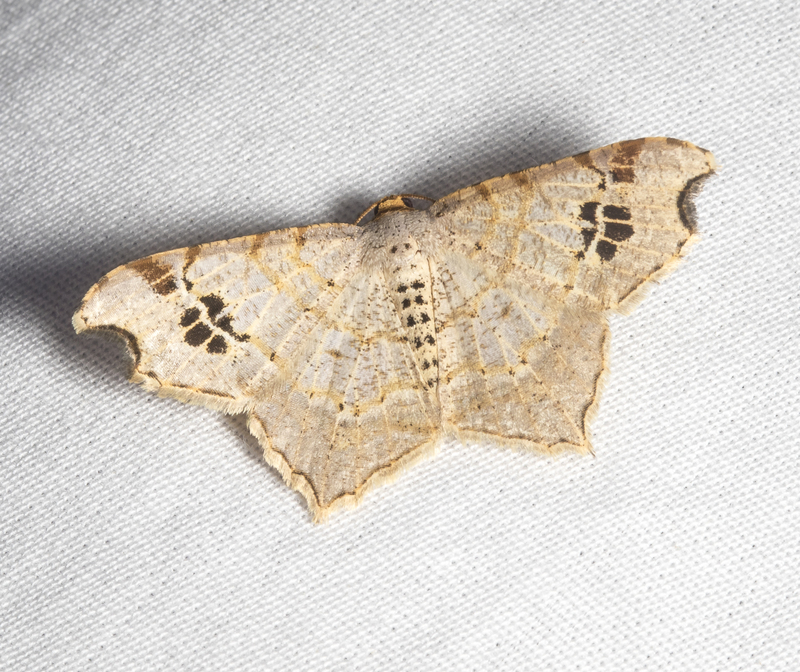 Several of the lug moths have the strange habit of pointing their abdomen skyward when at rest. 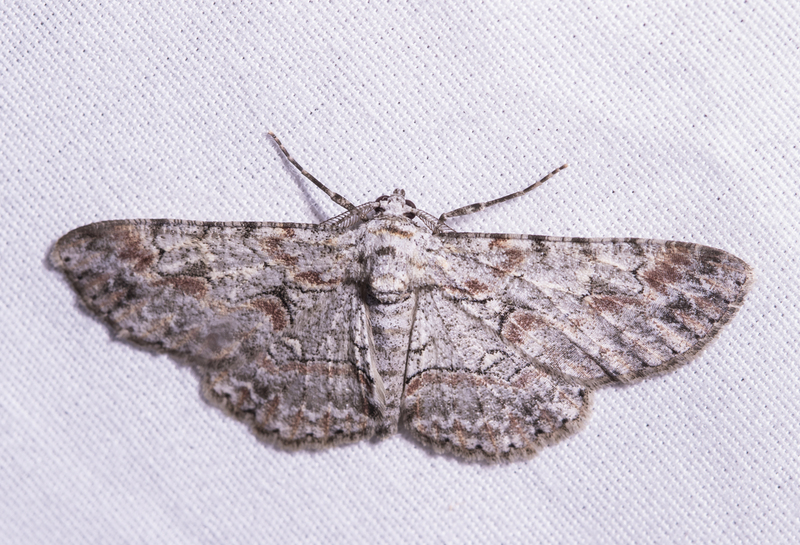 Pink-striped Oakworm Moth – Anisota virginiensis. 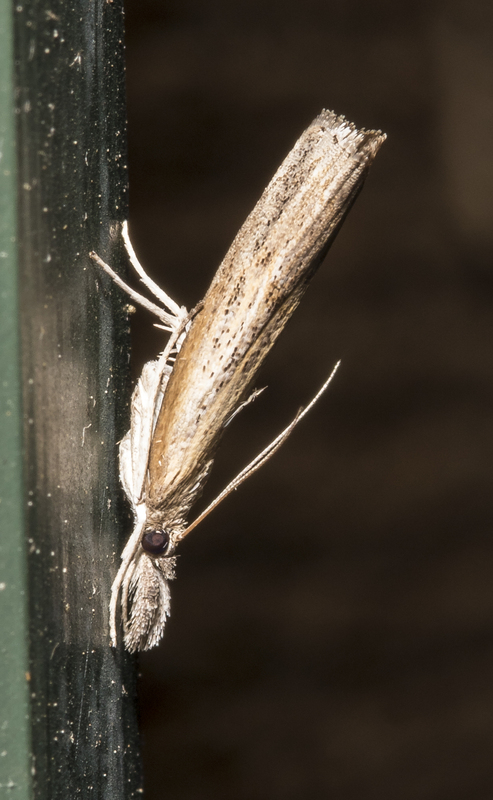 This female is a little over an inch long and is surrounded by some of the tiny moths I have yet to try to identify. 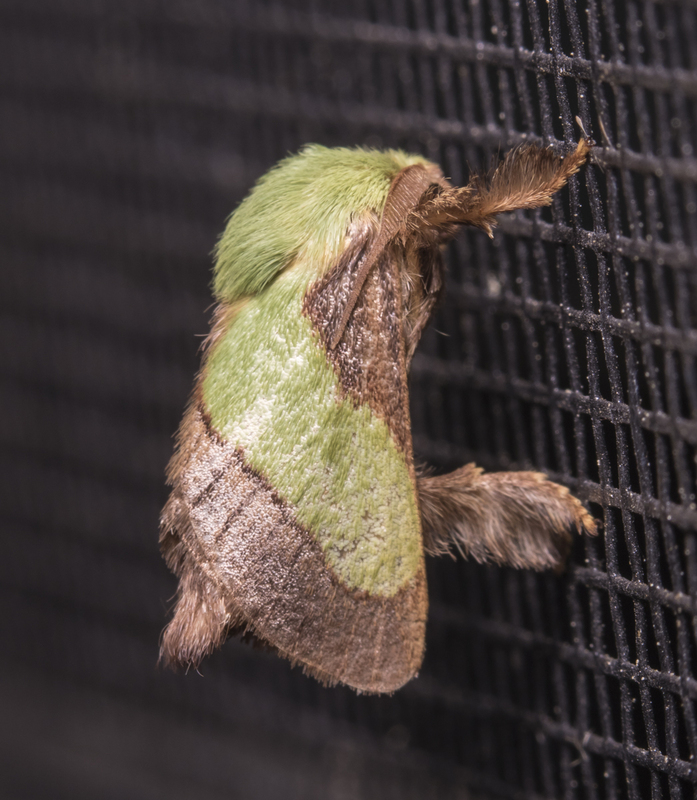 One of the slug moths, the Smaller Parasa, Parasa chloris, on a nearby window screen. I can read only a little, especially in the chapter on a new found interest, moths. They keep showing up (of course, I keep looking). I now have a routine of checking the screens before retiring for the night to see what might be out there. Usually, some small, tough to photograph, and even tougher for me to identify, specimens. But, every few nights, something really spectacular makes an appearance. 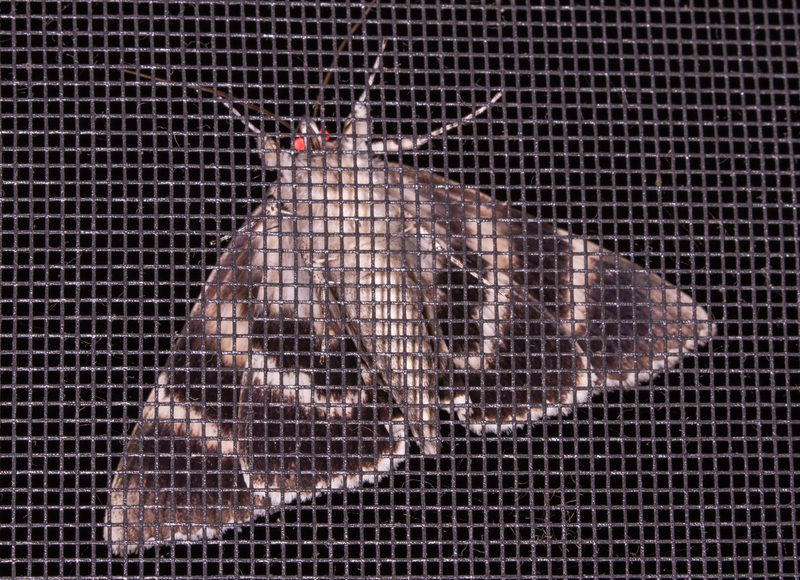 One night last week, two large, and exquisitely patterned individuals found their way to my screen door. 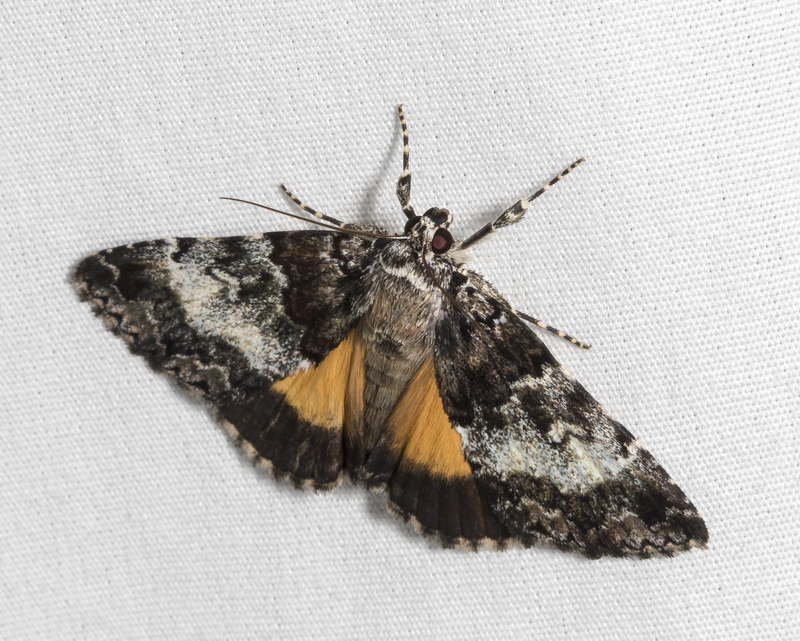 The first was hard to ignore – a large (wing span of over 3 inches) fluttering moth with bold stripes on the underside of the hind wings. 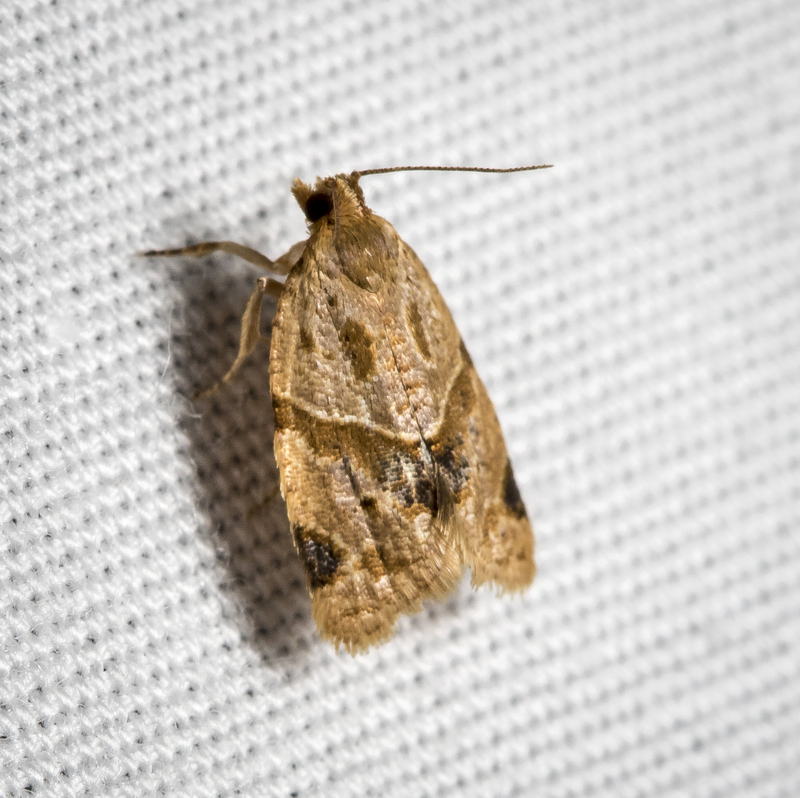 I suspected one of the Underwings, but had not seen one with primarily black and white colors on the underside before. 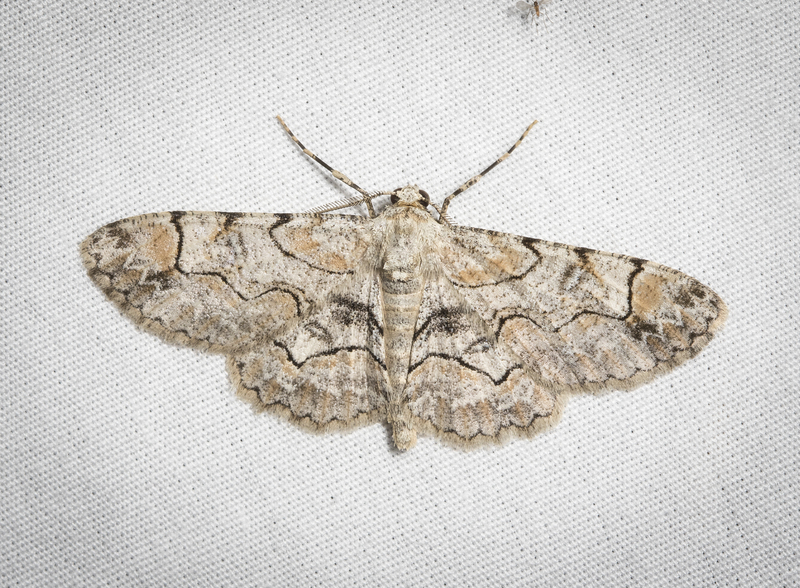 After a quick photo of the moth through the screen, I went out to find an intricately patterned beauty. 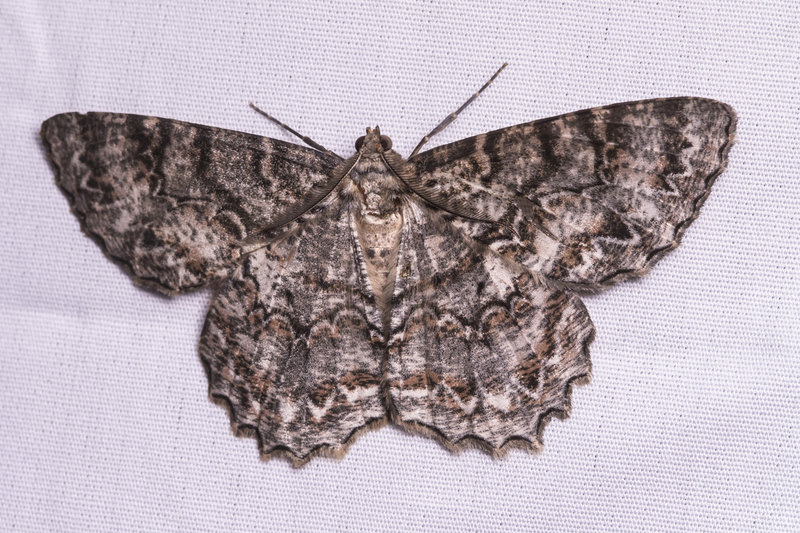 It turned out to indeed, be one of the Underwings, Genus Catocala. 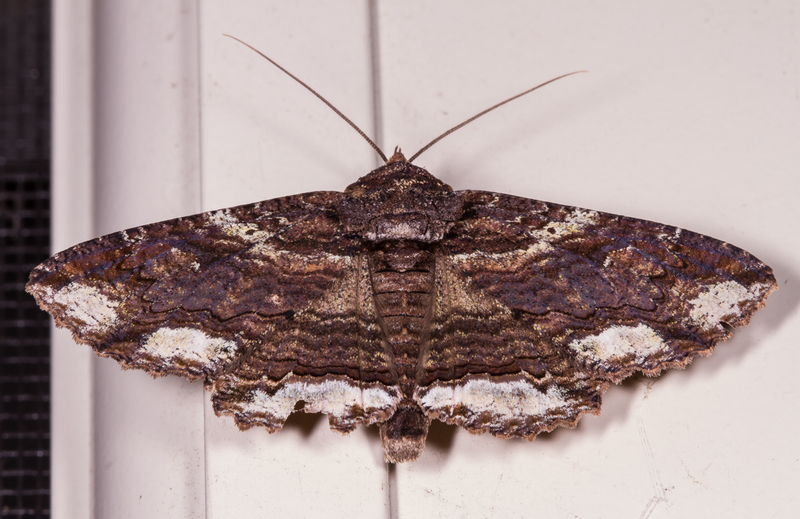 This one is called the Widow Underwing, Catocala vidua. The group is so named because the genus name means “beautiful below” in Greek. 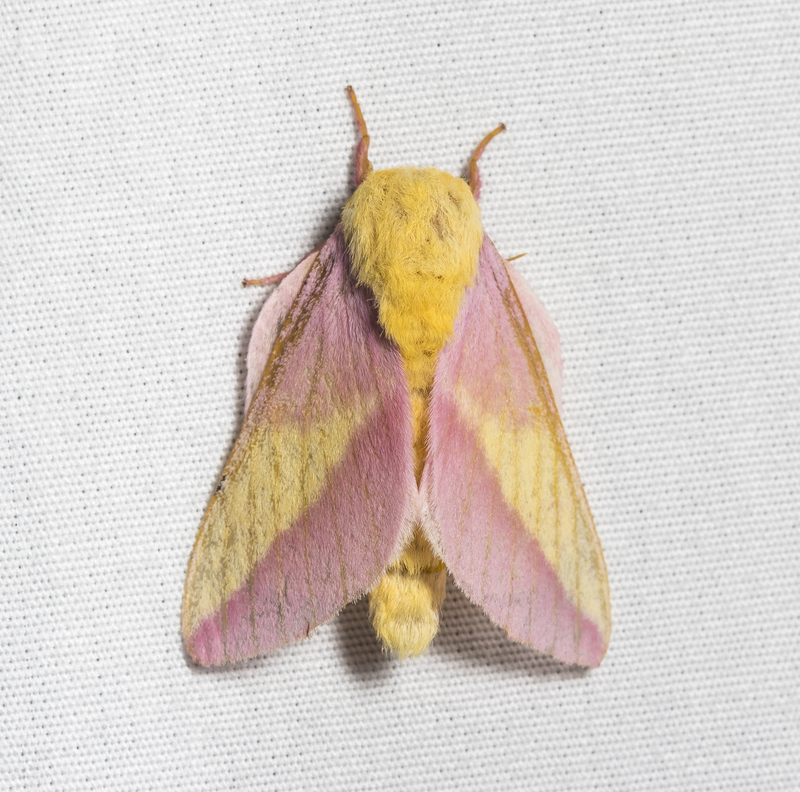 Most have bold colors on their hind wings, which are usually only revealed when the moth is flying or startled. In this case, the hind wings are mainly black and white, but beautiful nonetheless, both above and below. 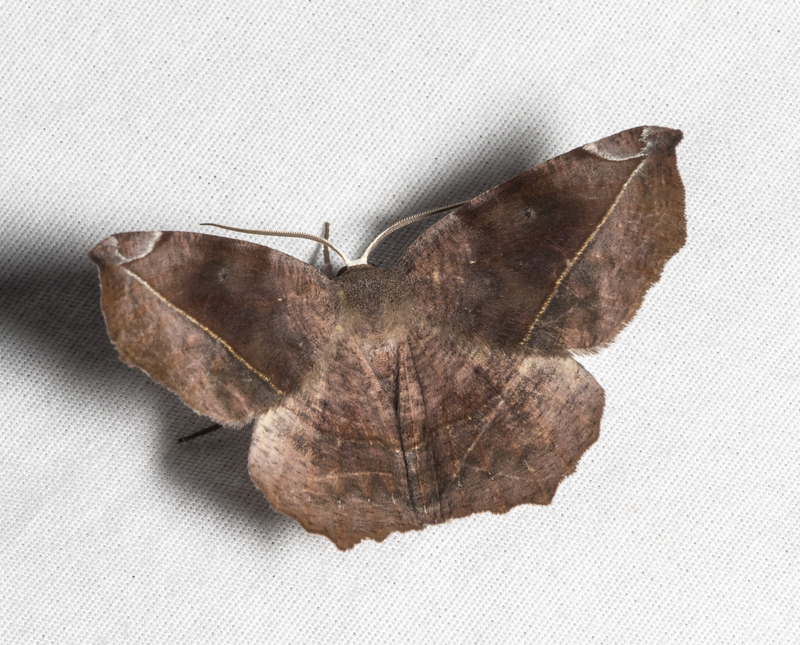 The muted colors and intricate pattern of the dorsal surface of the forewings most likely serves this moth well when resting on tree bark in its habitat of deciduous forests. 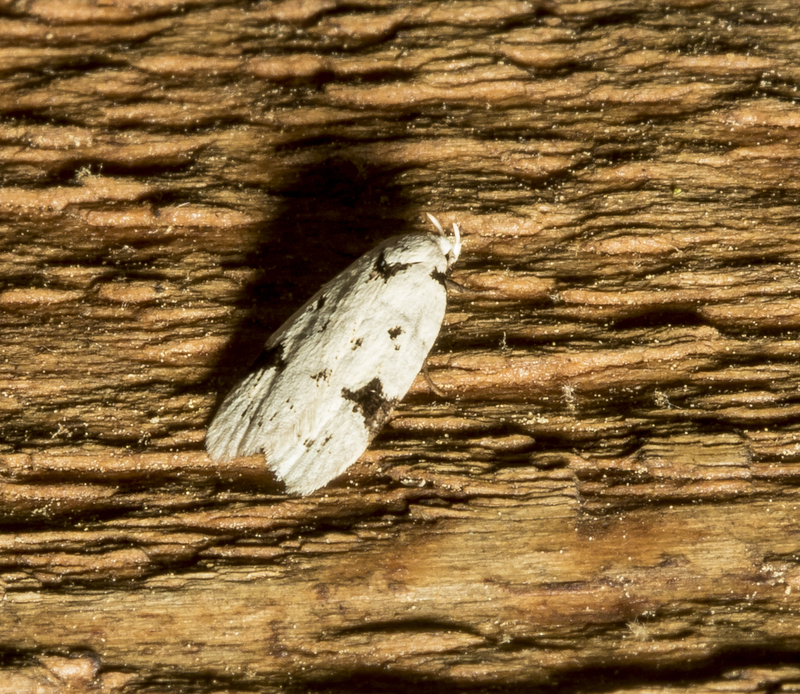 Larvae feed on leaves of hickory, walnut, and a few other tree species. 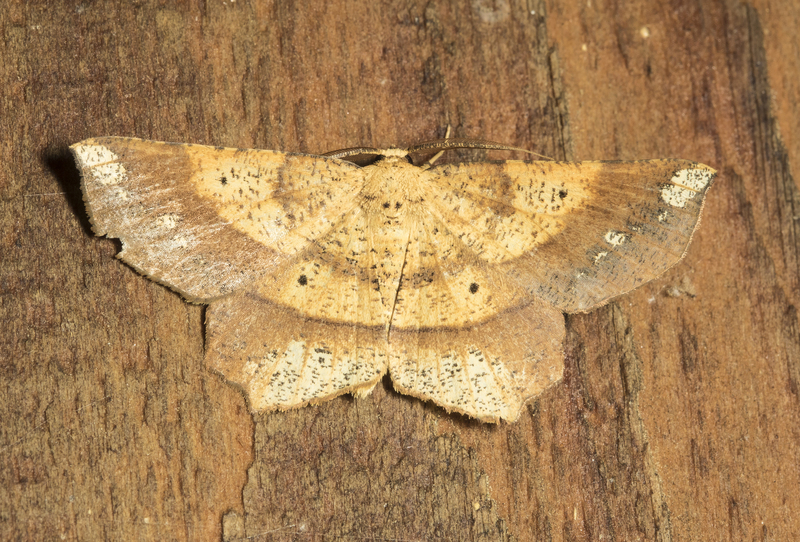 Nearby, but much more subdued in its activity, was another beautifully patterned species. 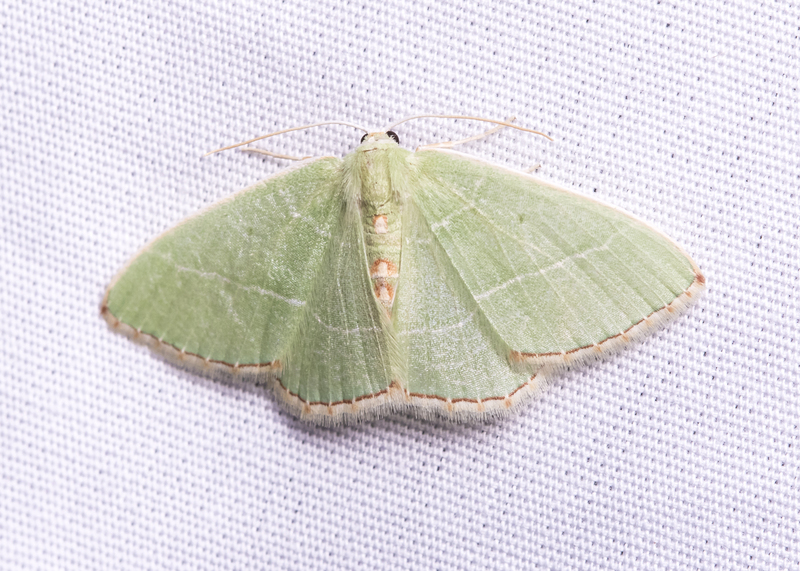 This one was also relatively easy to identify – a Lunate Zale Moth, Zale lunata. 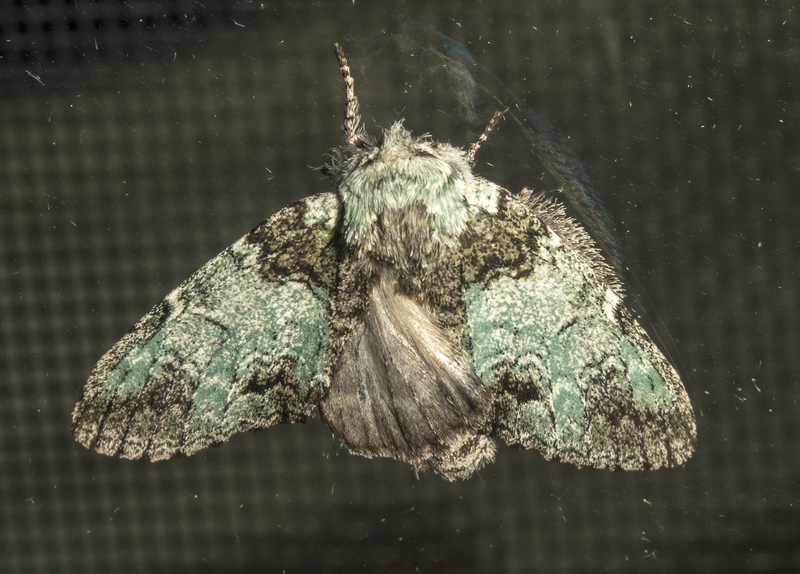 Smaller (wing span about 2 inches) than the first moth, it was equally intricate in its wing design, again mimicking tree bark, but perhaps with splotches of lichen. 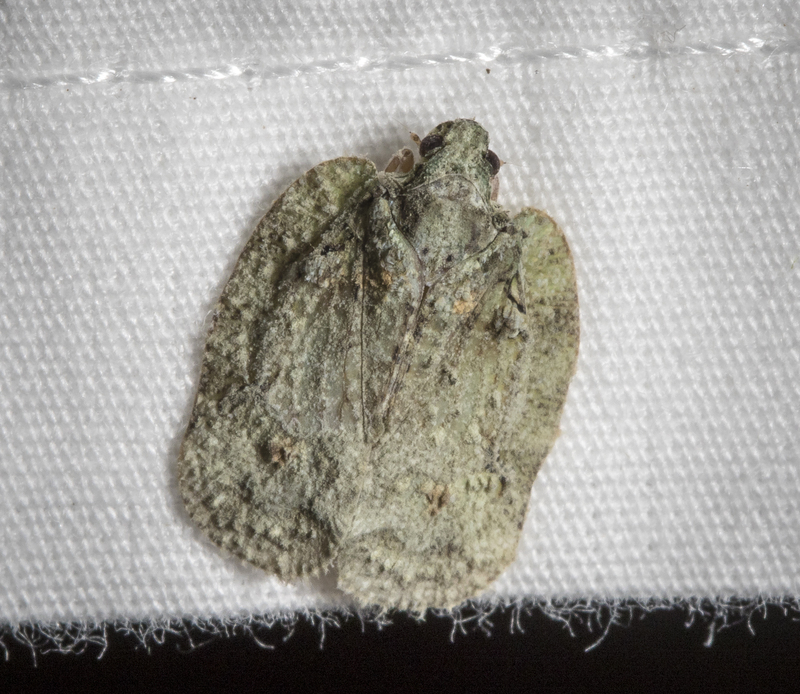 The lunate part of its name refers to the crescent-shaped splotches along the wing edges. 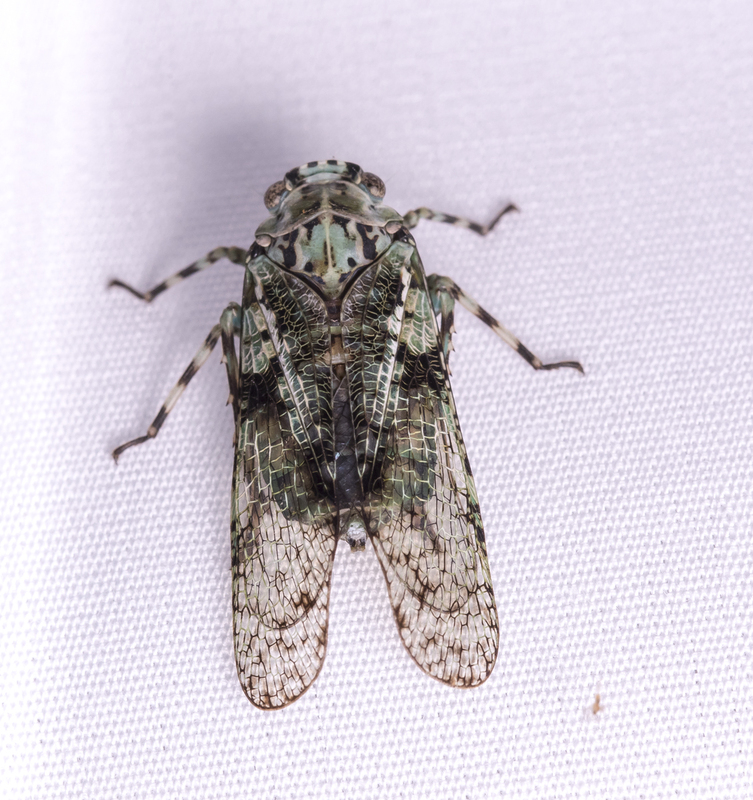 But, in looking at various online sources, this species can be quite variable, so I am glad this one had prominent white splotches along the wings to make identification a bit easier. 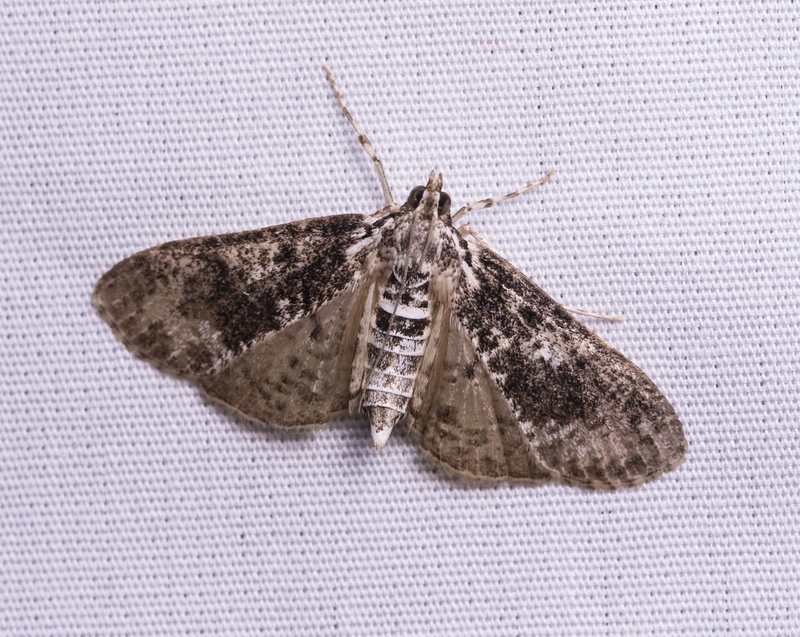 Larvae feed on a variety of shrubs and trees. 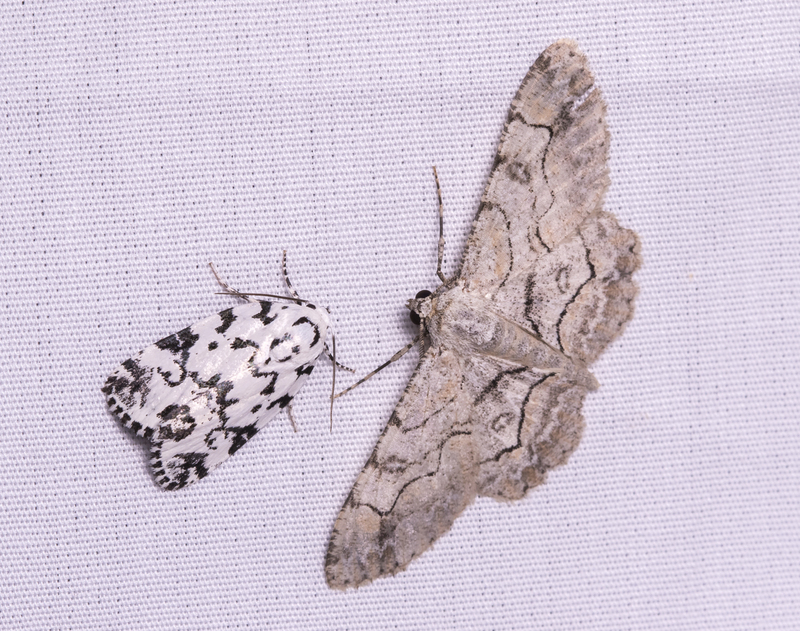 Looking closely at the patterns of these two moths helped me realize the incredible beauty and diversity of this group of insects and just reinforces my desire to learn to read more of the pages in this chapter of Nature’s book. 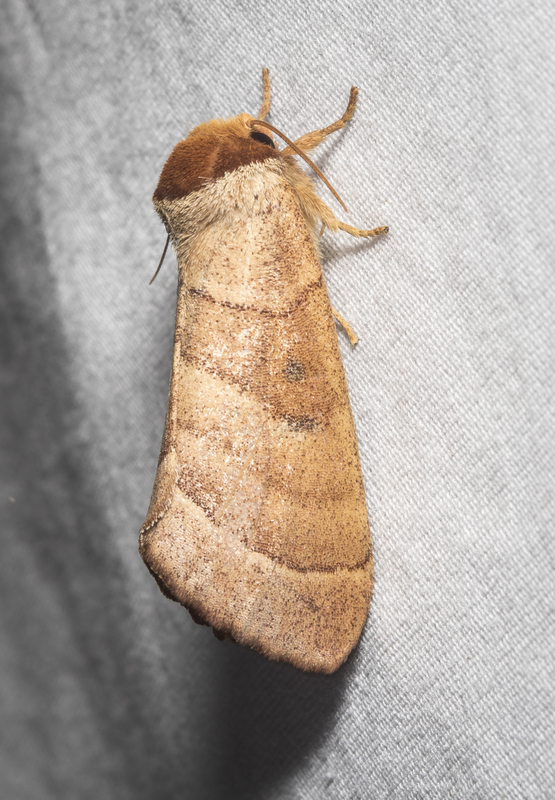 NOTE: When I finished writing this post, I went out to check the screens and was rewarded with a bonus – a large female Imperial Moth (measured wing span of 5 inches)…hoping she lays eggs on nearby trees.